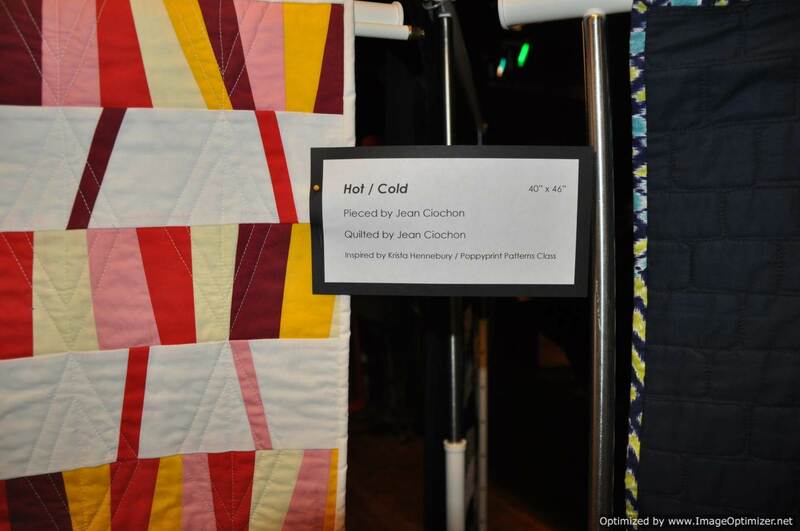 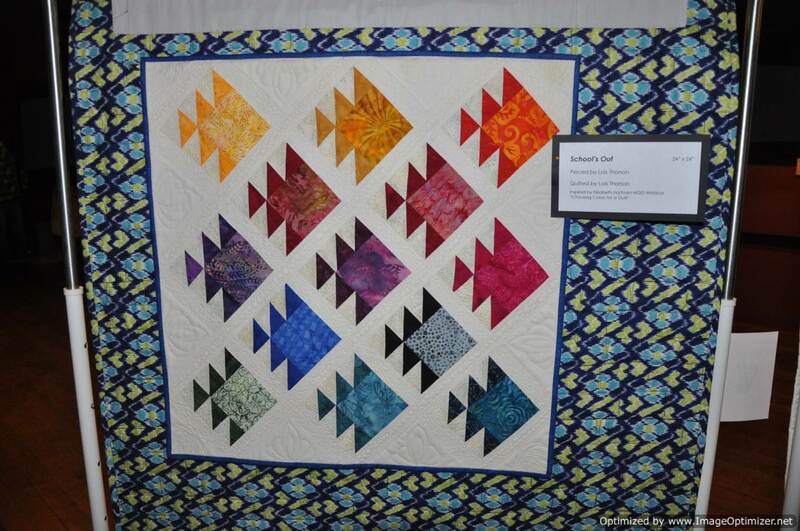 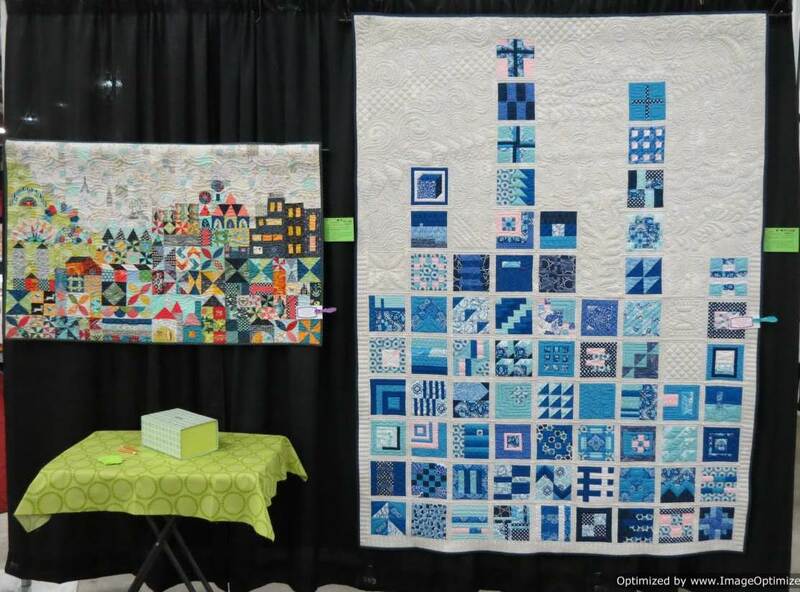 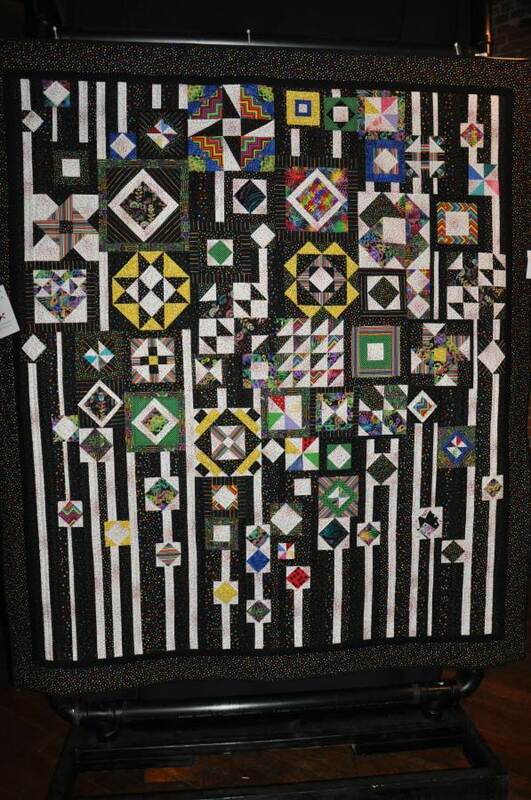 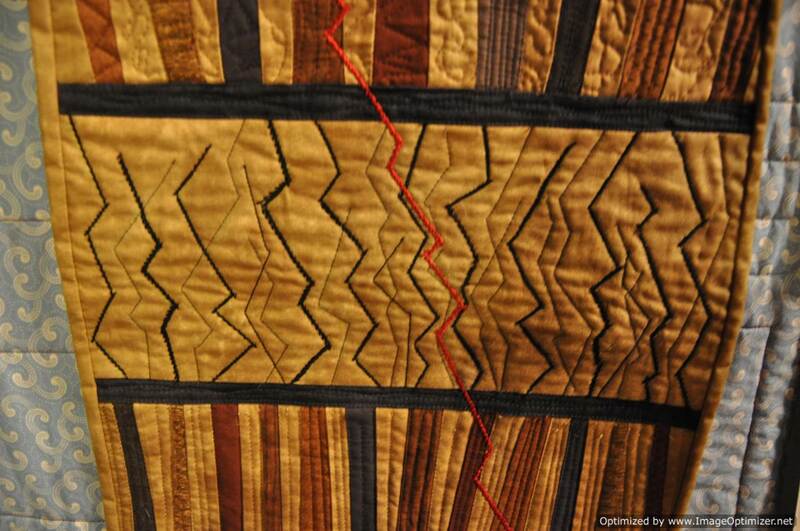 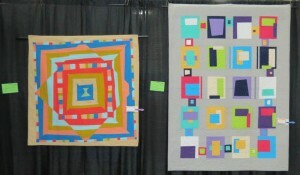 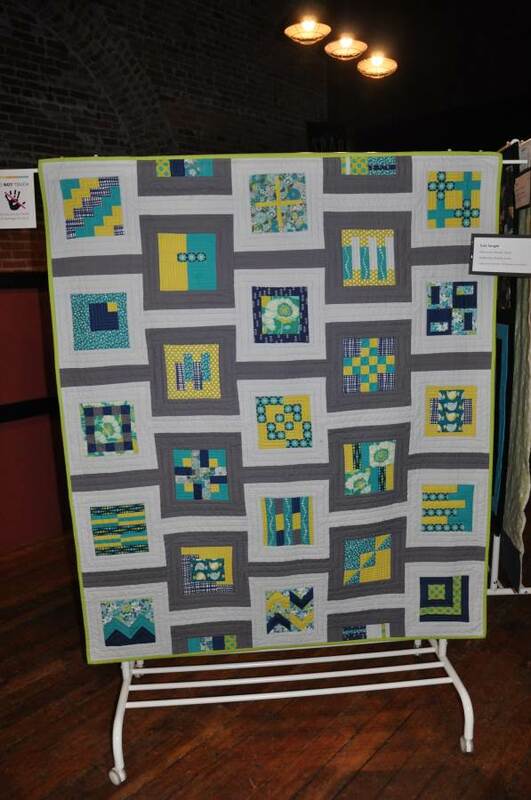 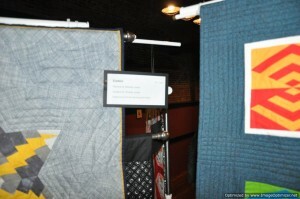 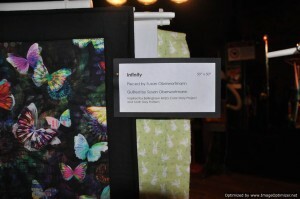 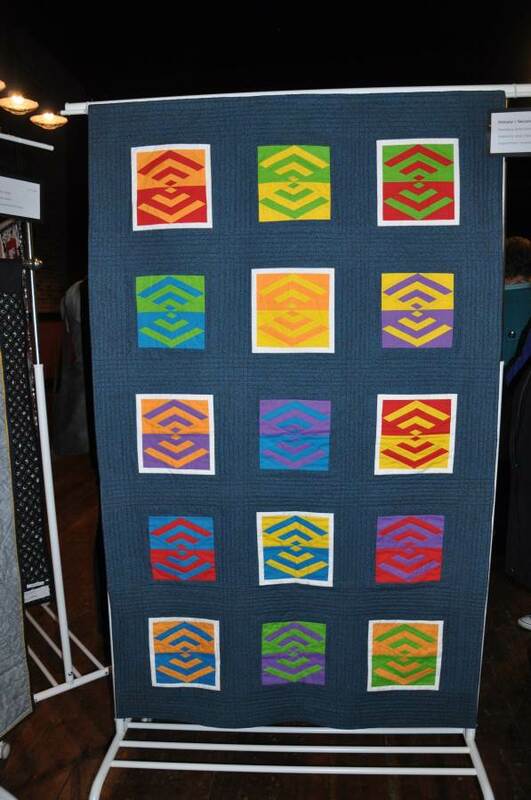 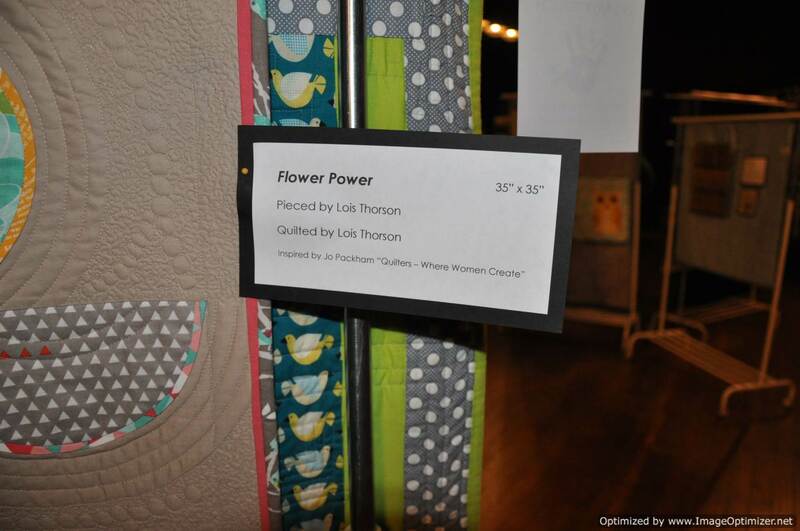 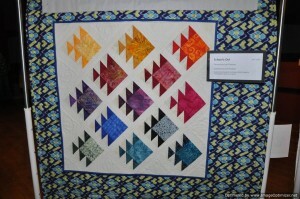 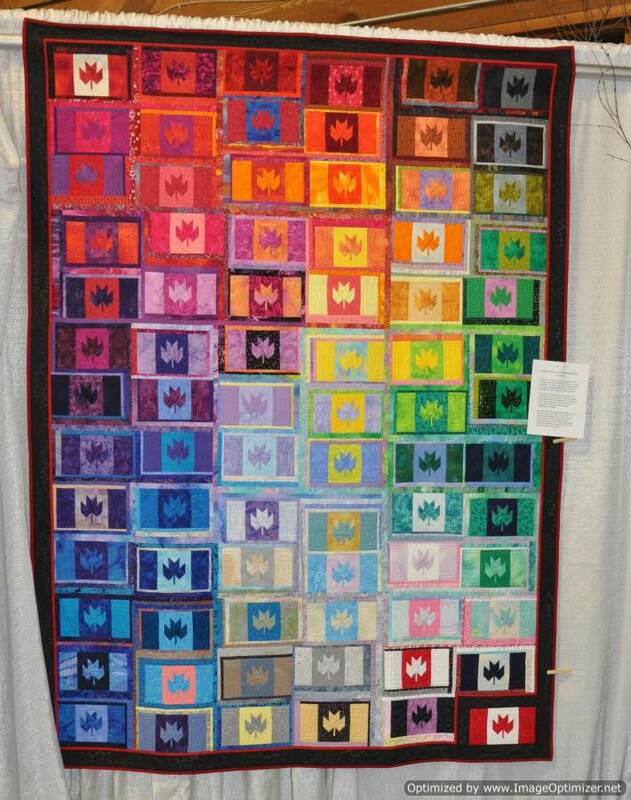 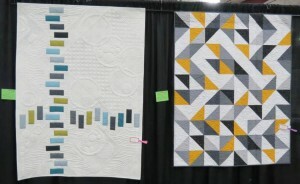 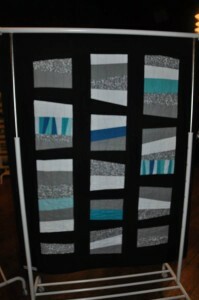 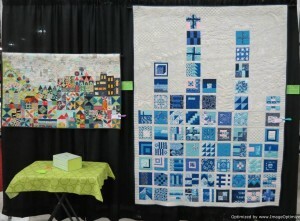 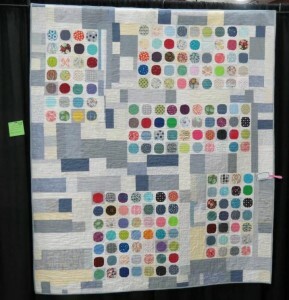 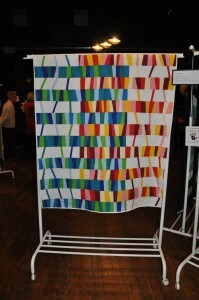 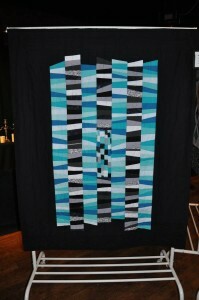 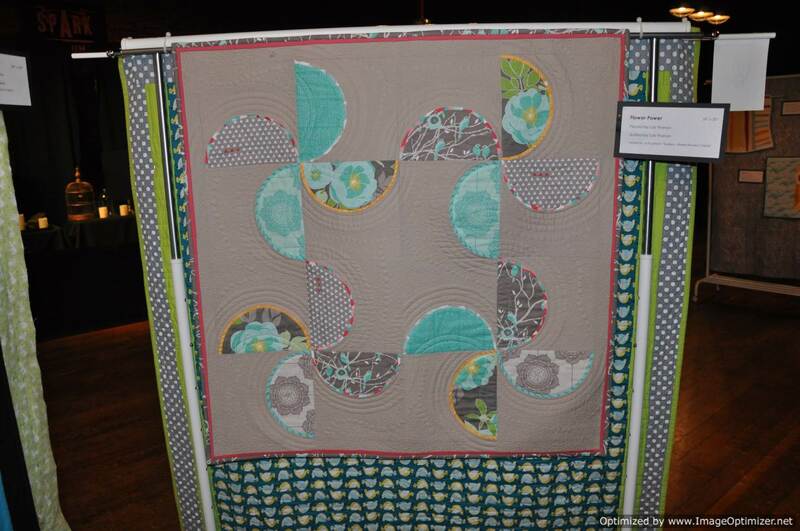 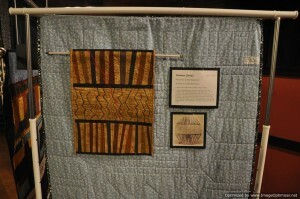 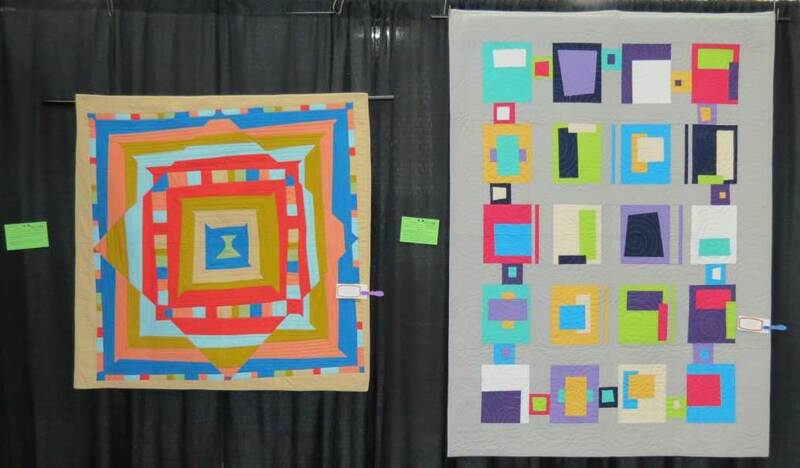 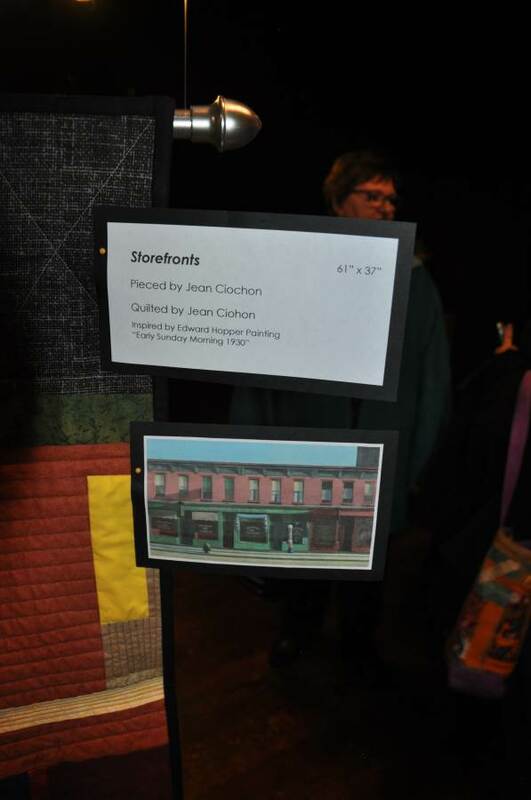 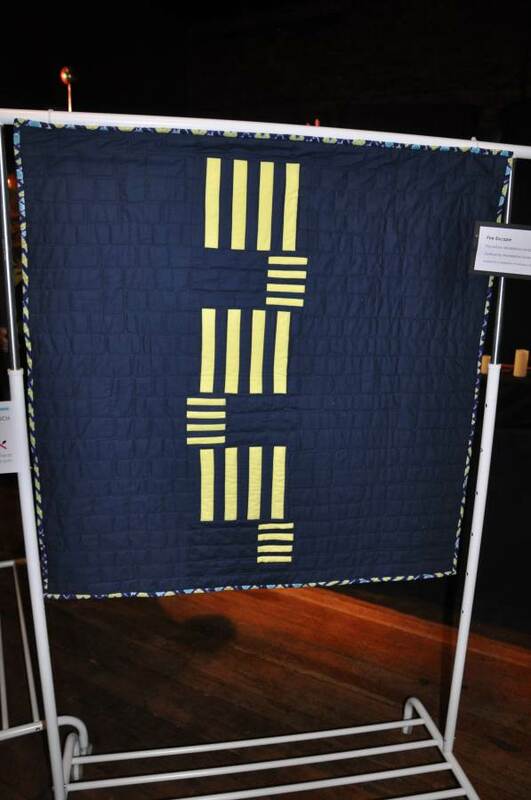 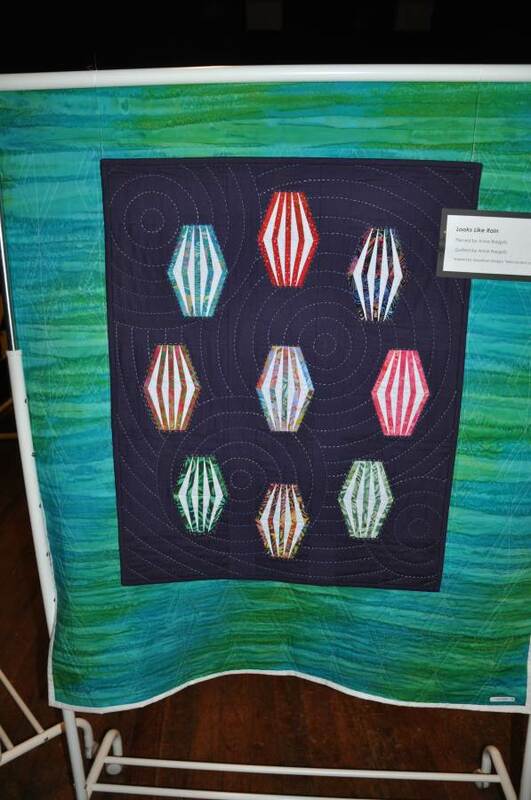 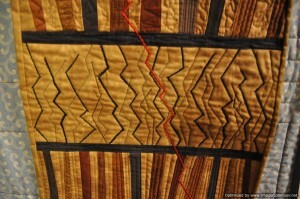 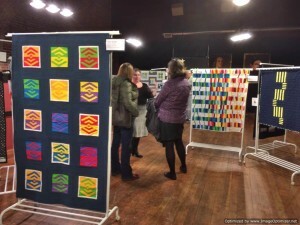 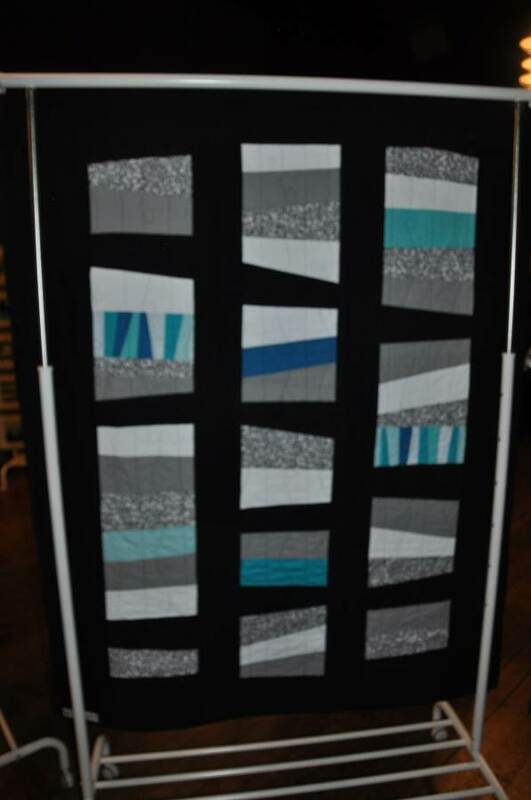 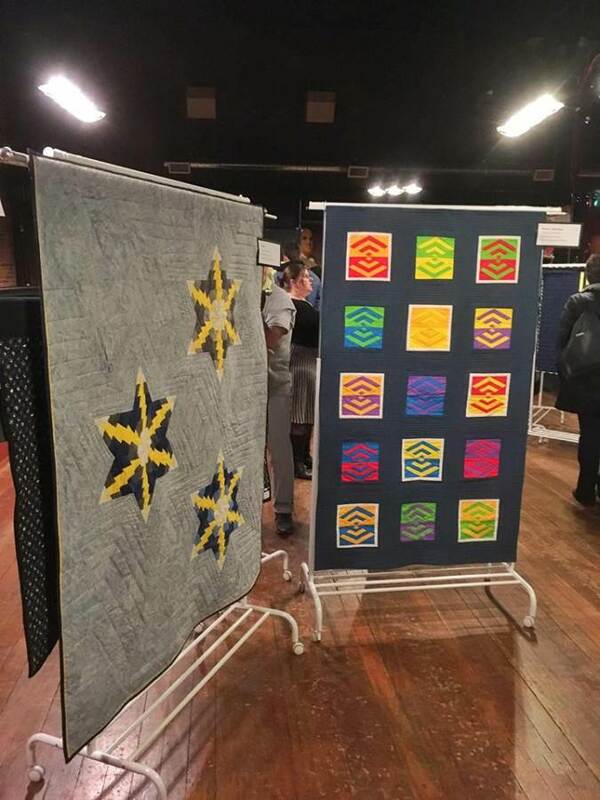 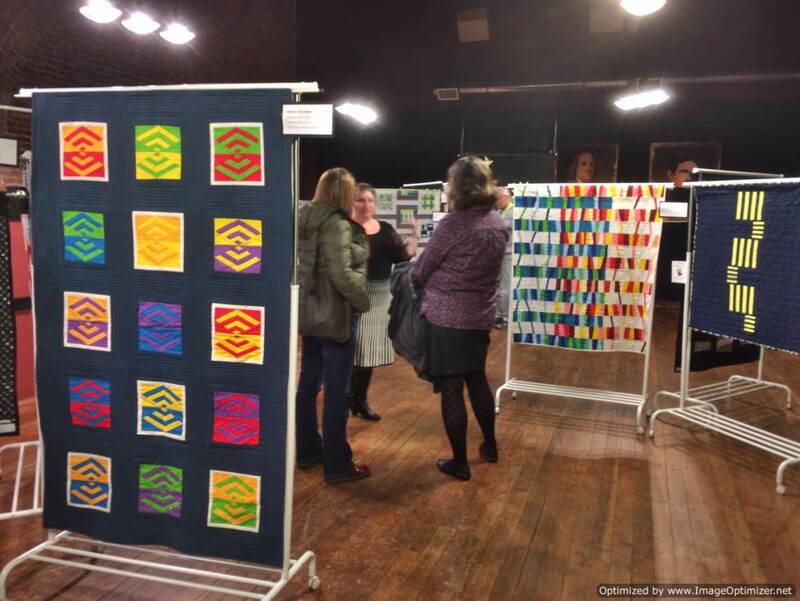 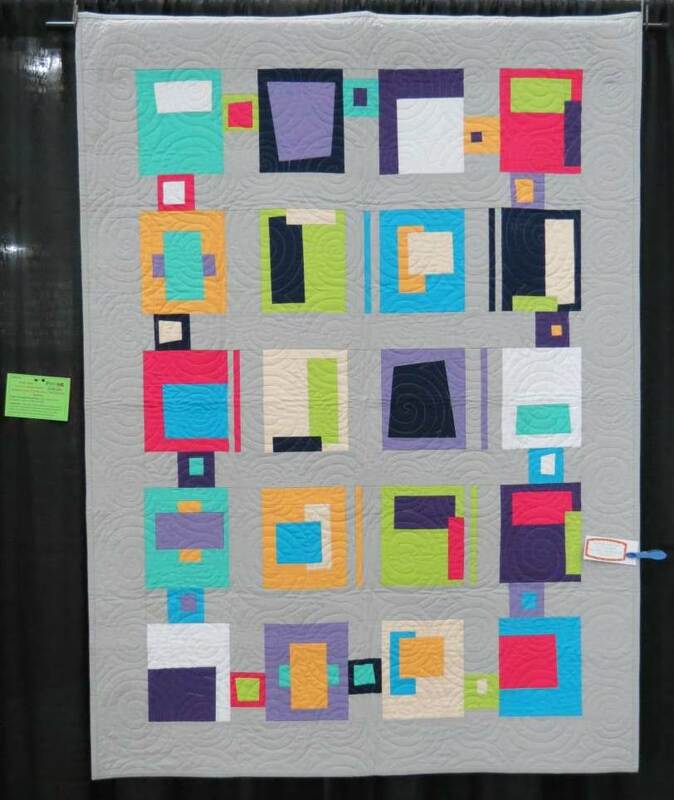 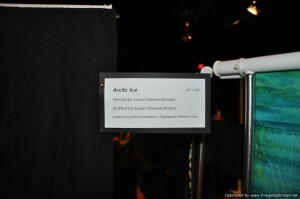 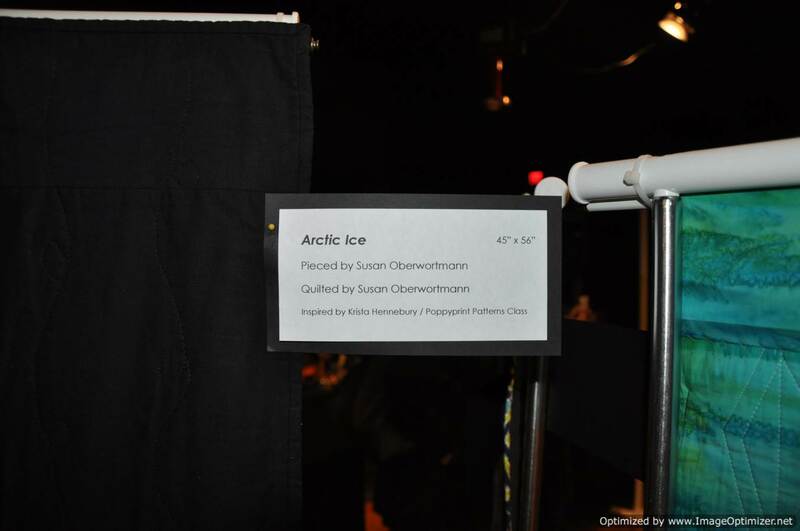 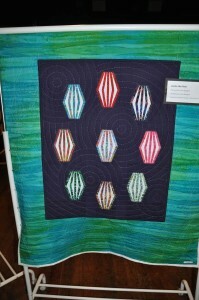 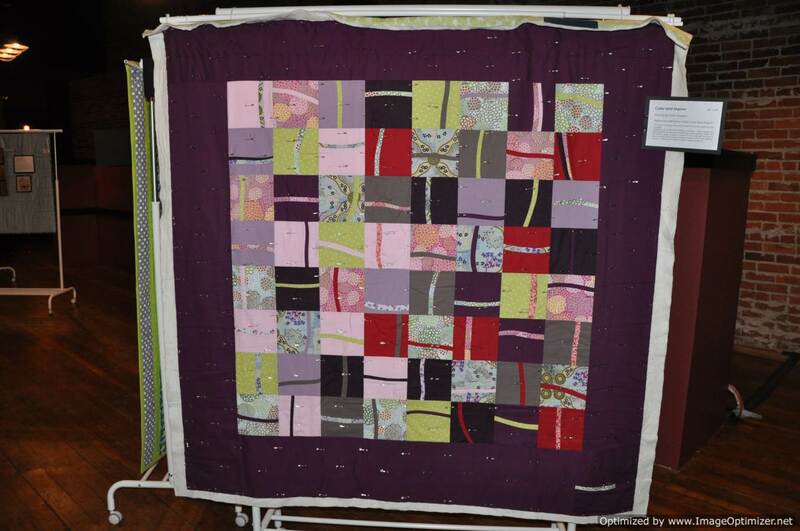 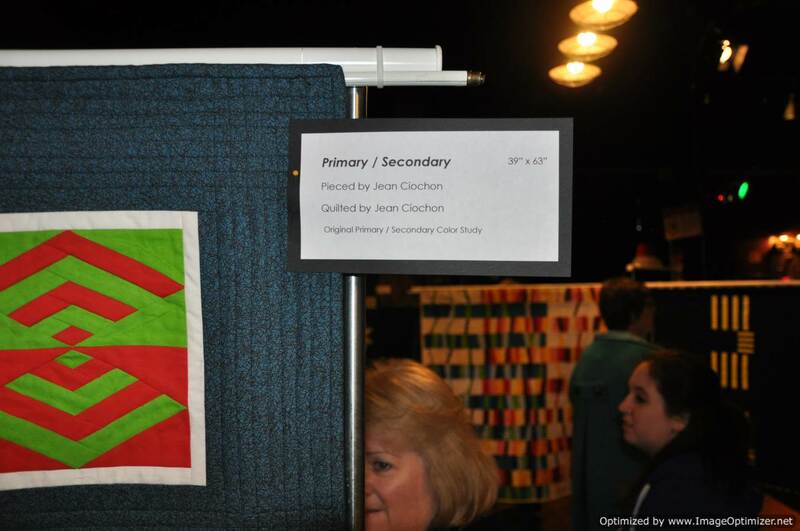 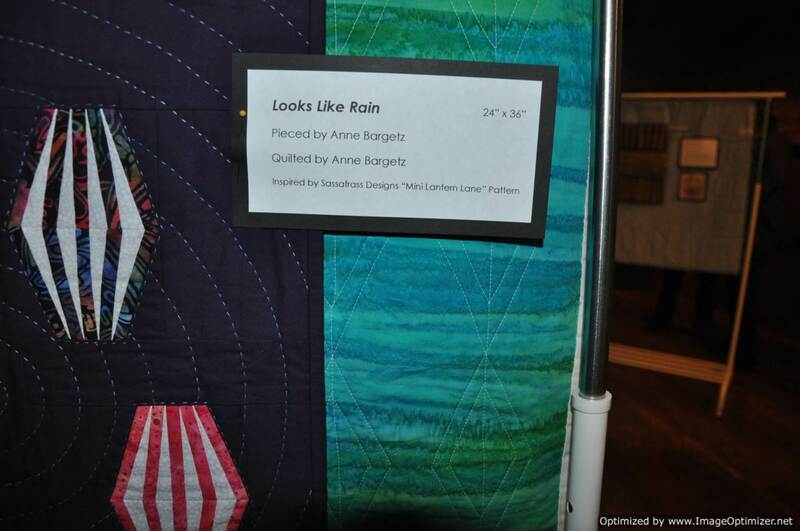 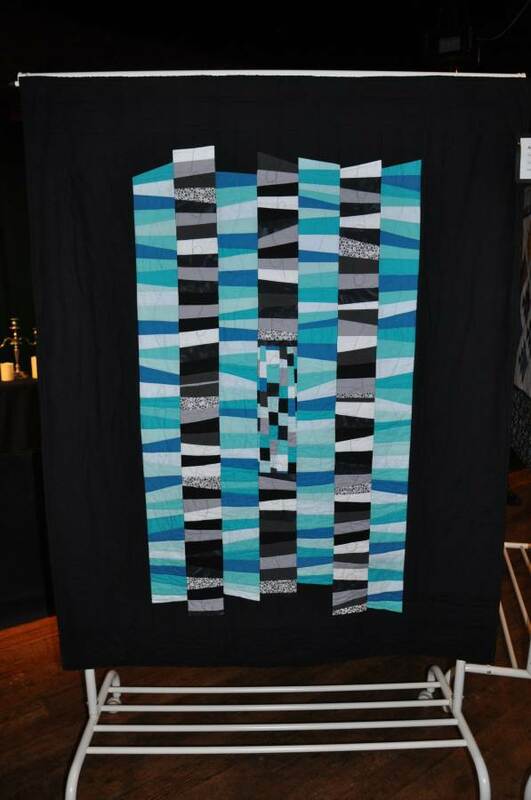 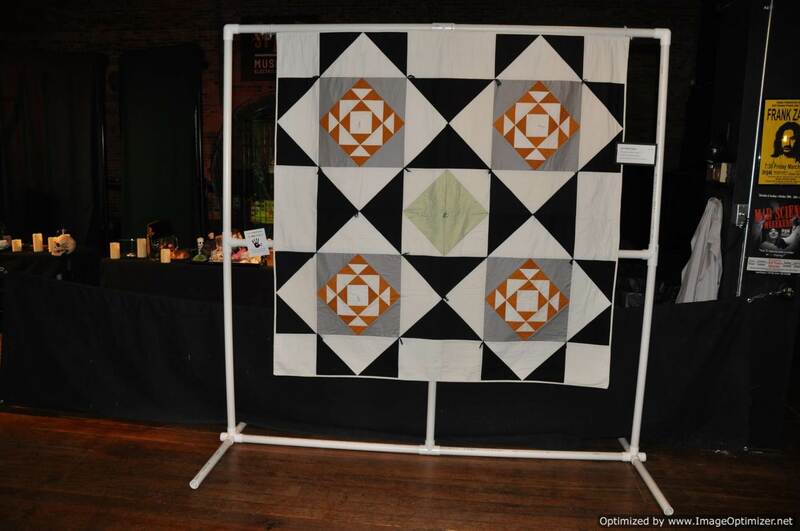 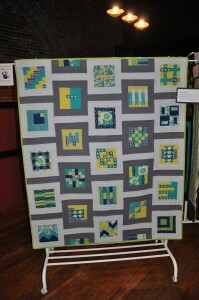 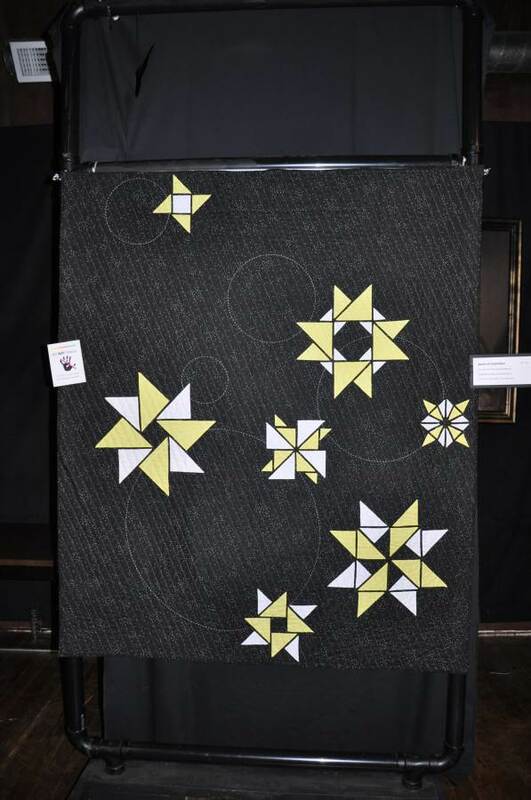 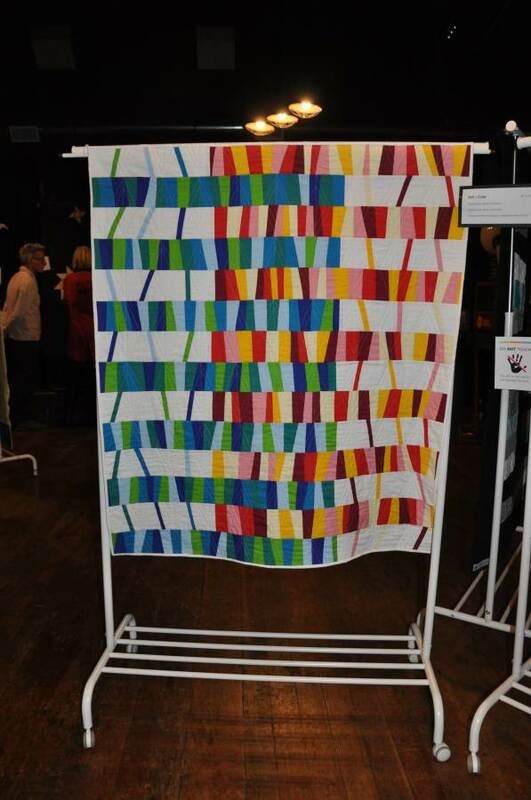 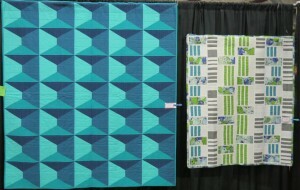 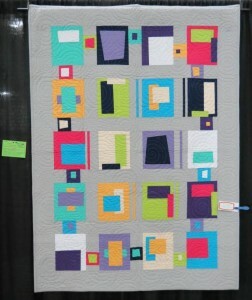 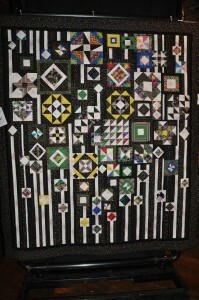 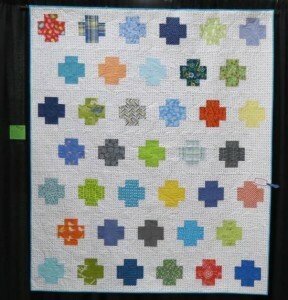 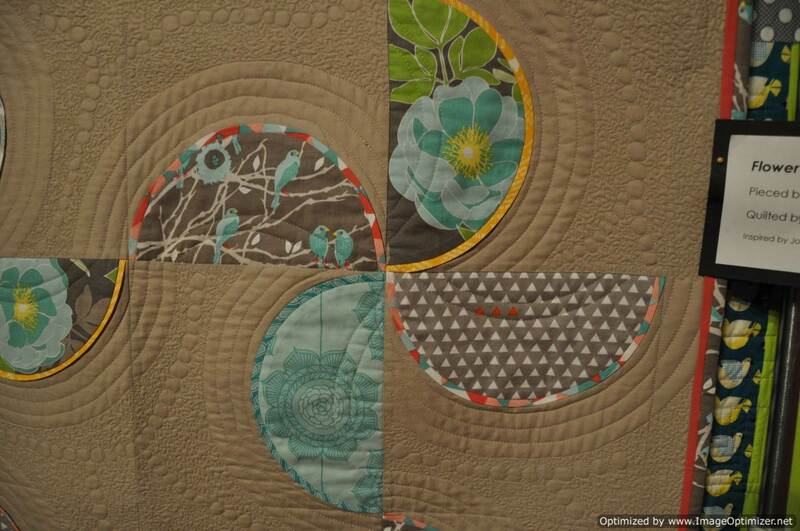 Each year the organizers of Creativ Festival invites my modern quilt guild to display some of our work. 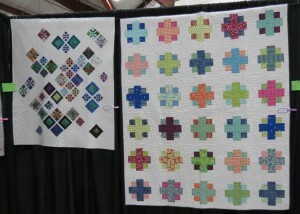 We are a small group so this annual display doubles as our “quilt show”. 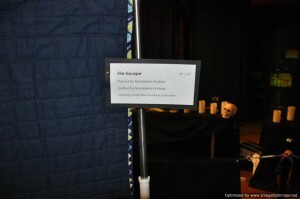 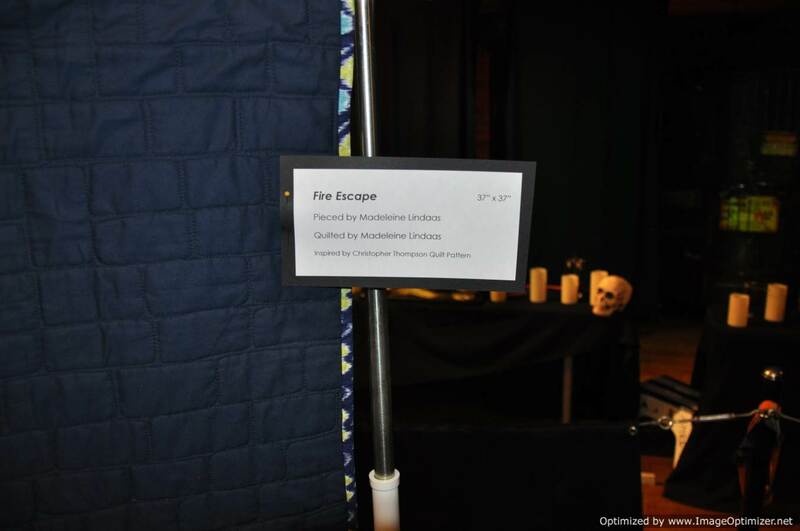 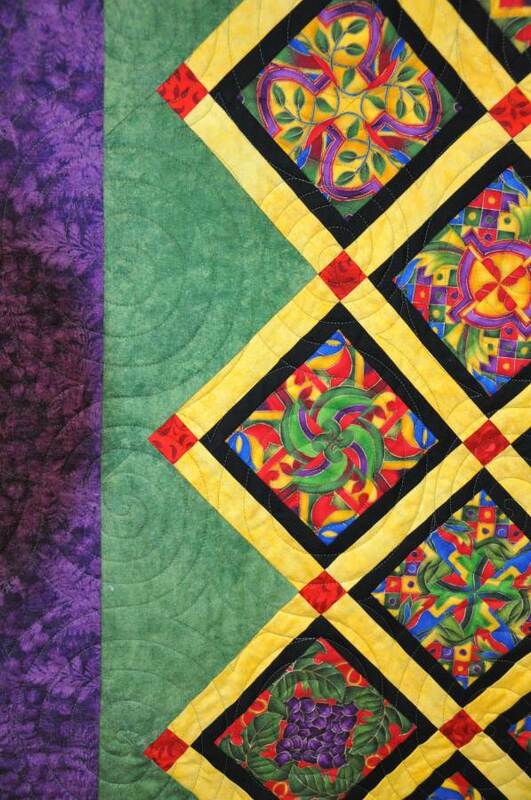 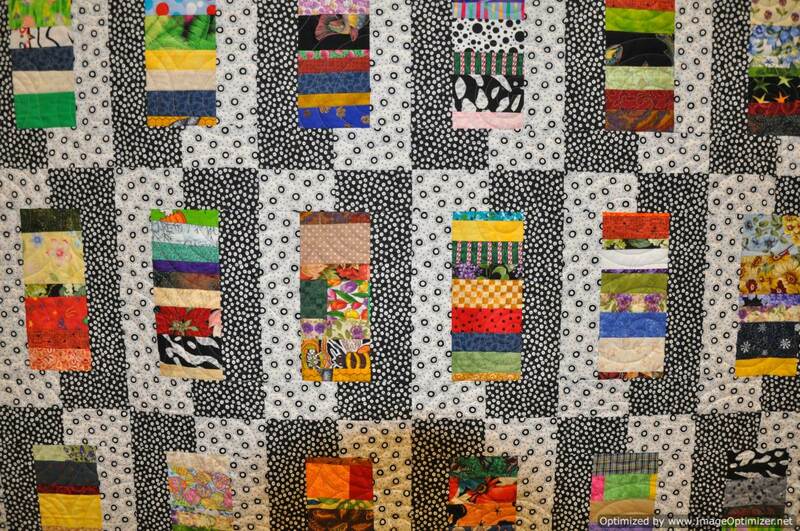 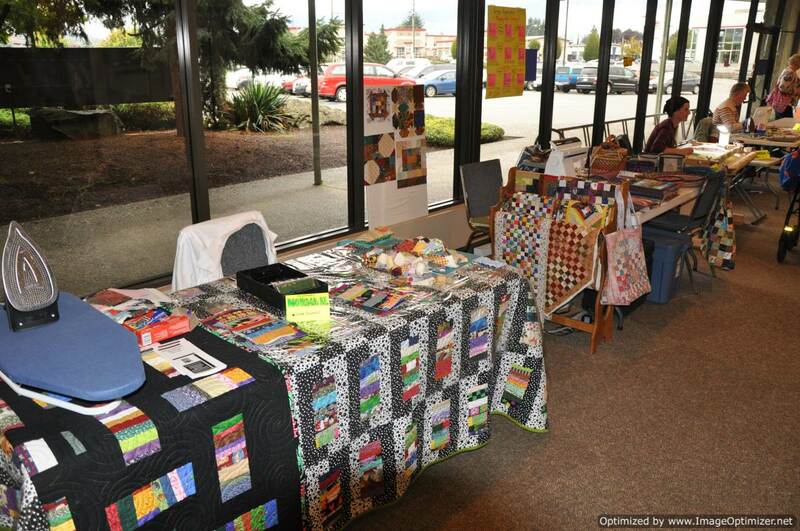 We are given an area to display our quilts that is front and center as you enter the Tradex building. 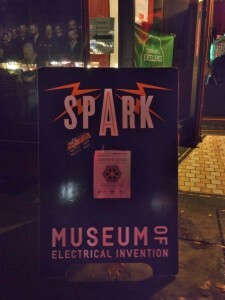 We are very fortunate to be provided with such a prominent space. 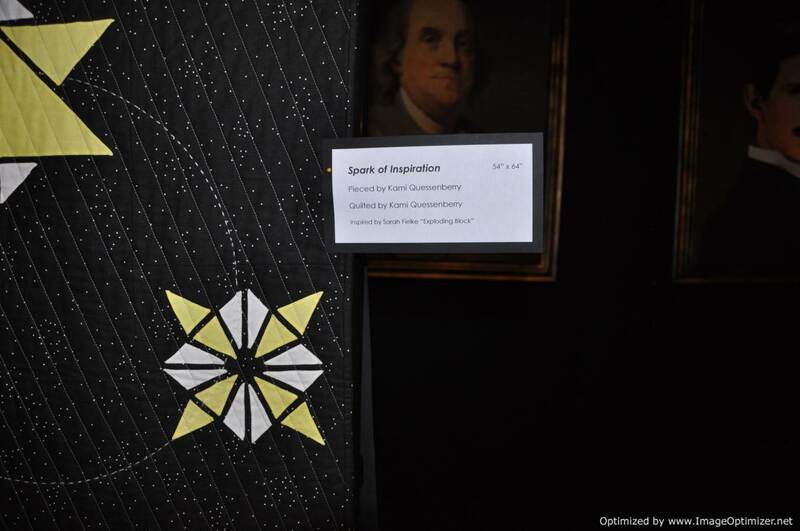 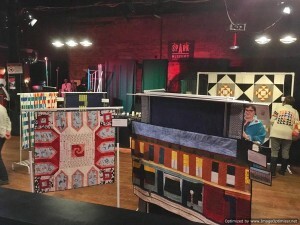 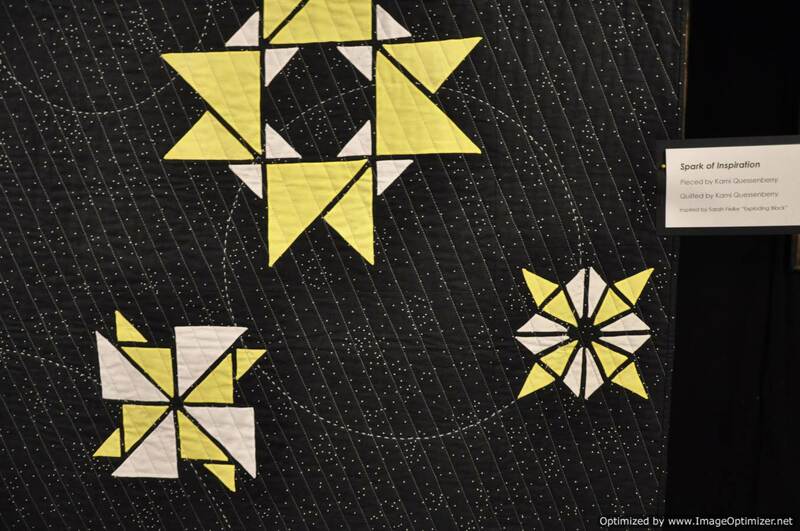 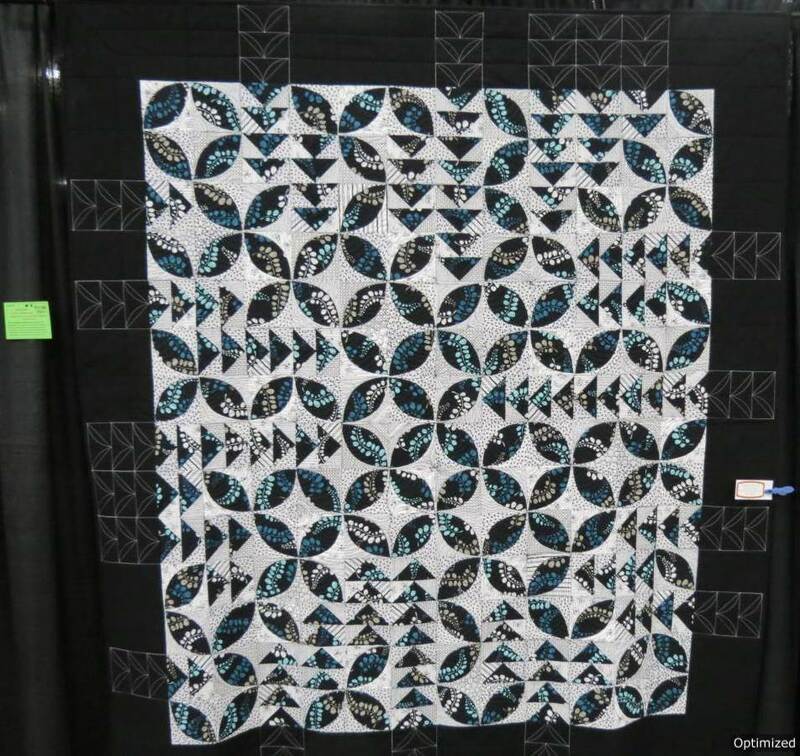 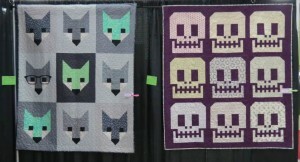 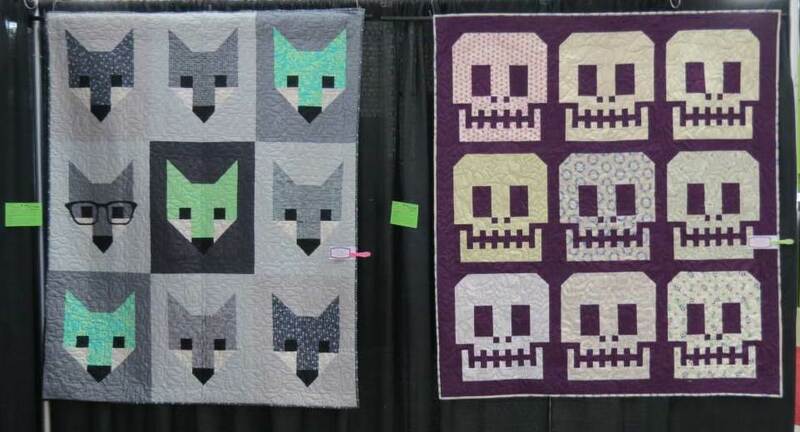 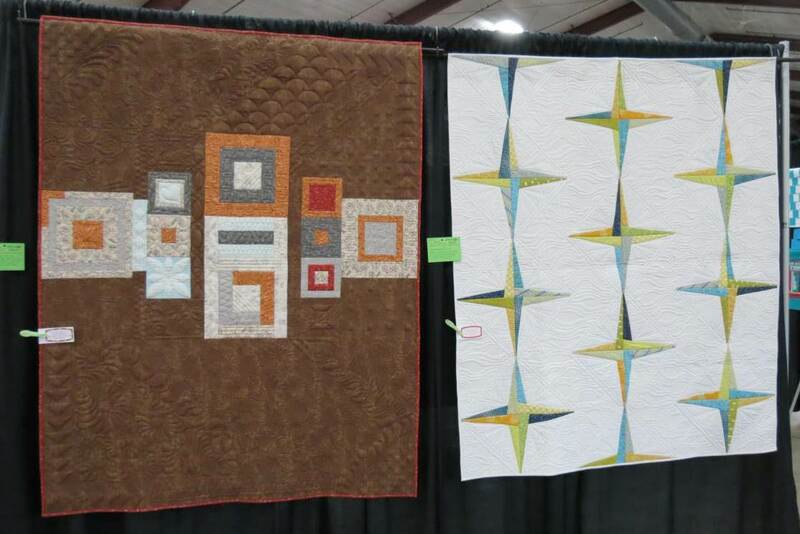 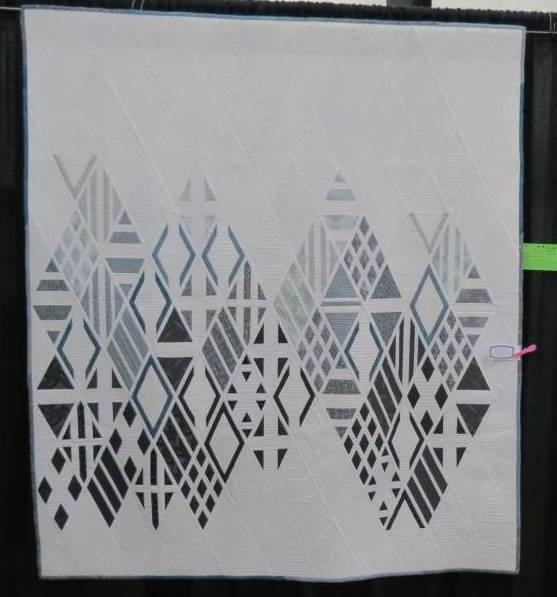 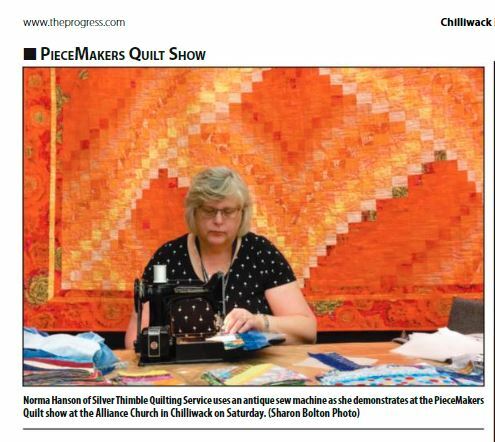 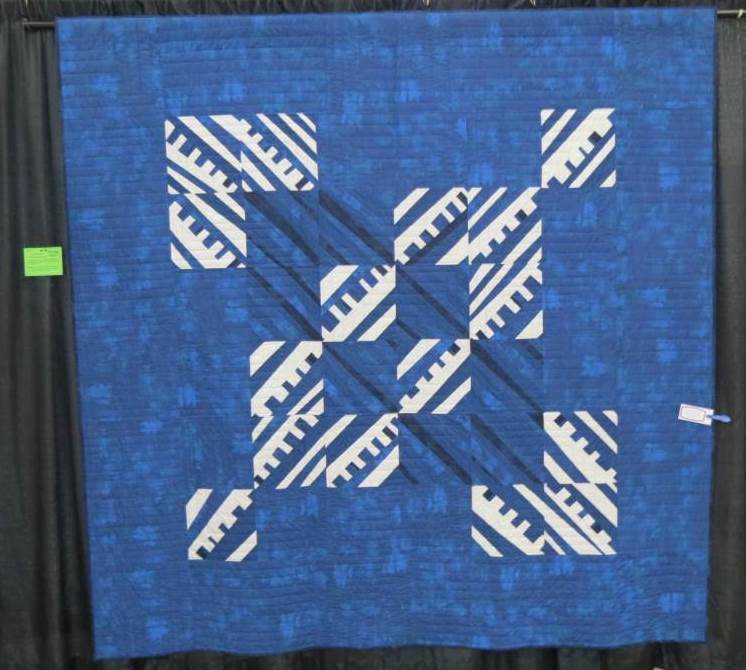 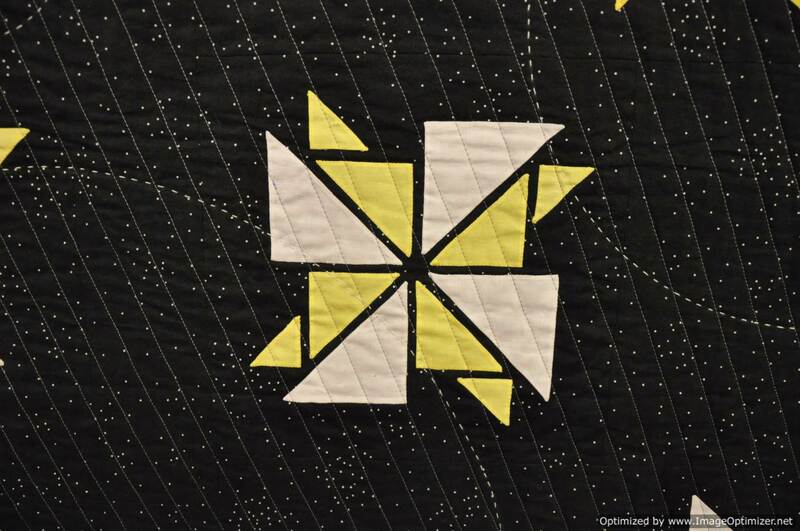 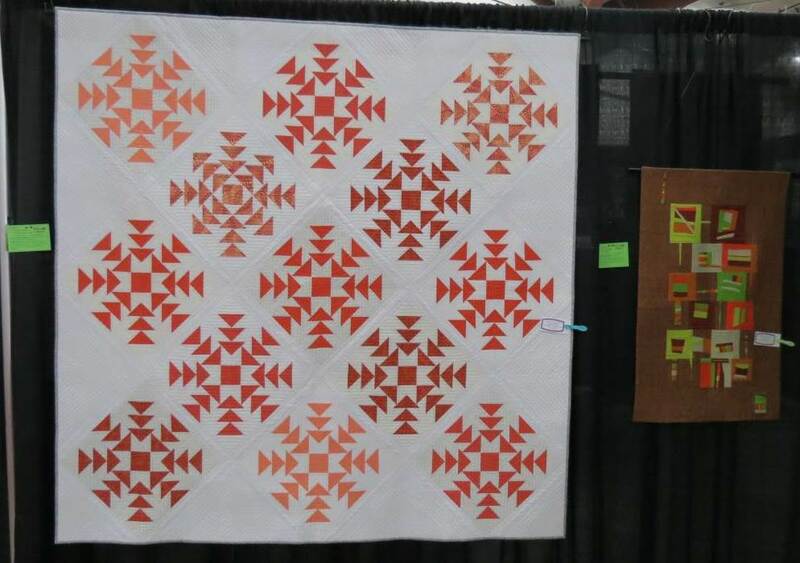 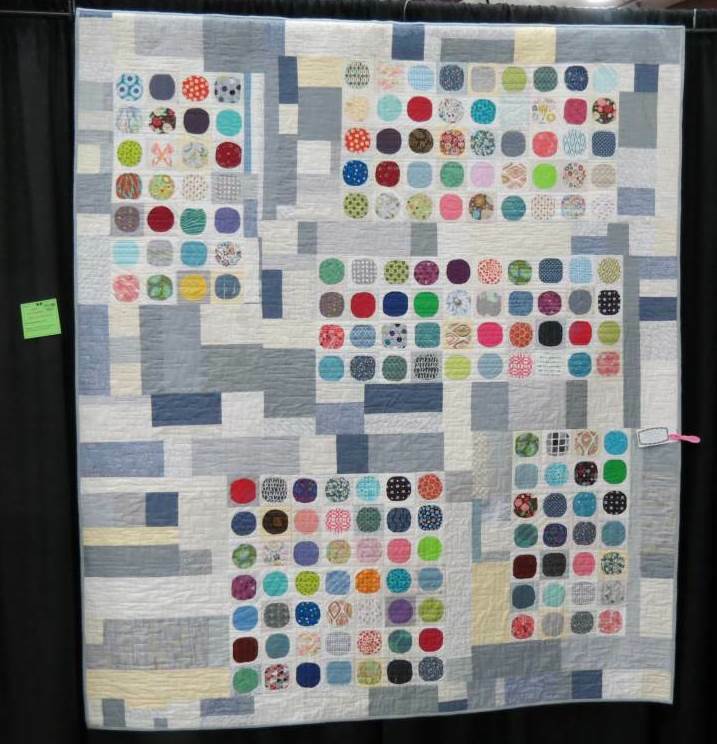 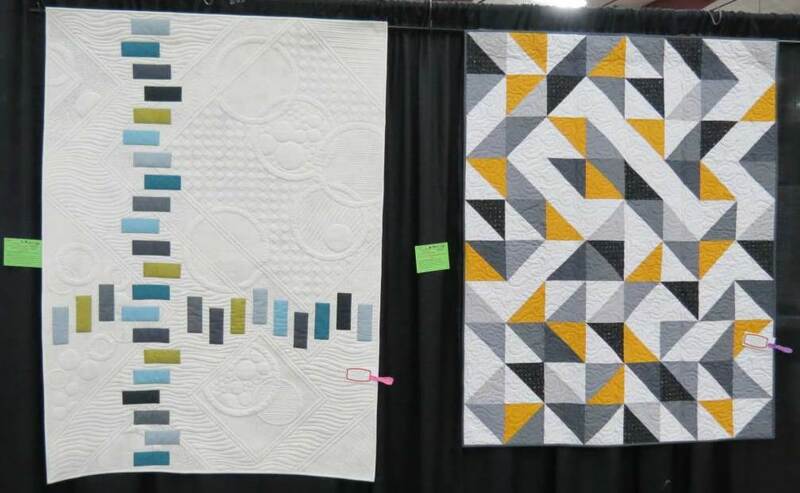 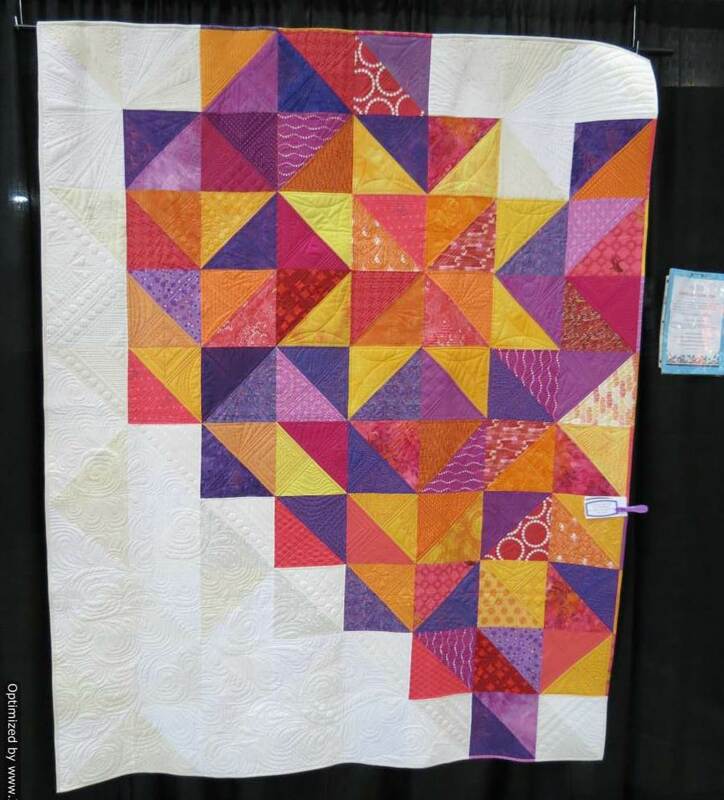 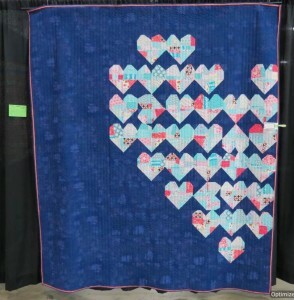 This is the first year that our guild entered a charity quilt into QuiltCon (the Modern Quilt Guild’s annual international show). 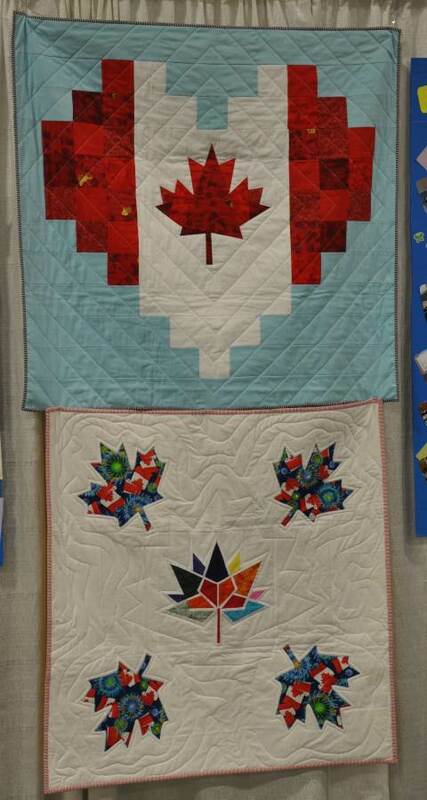 Our charity quilt was back from QuiltCon in California so we were able to have it on display as well. 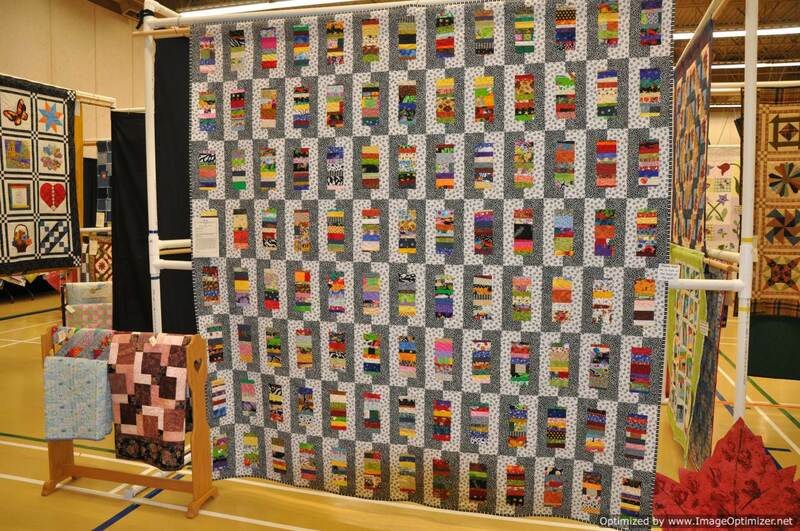 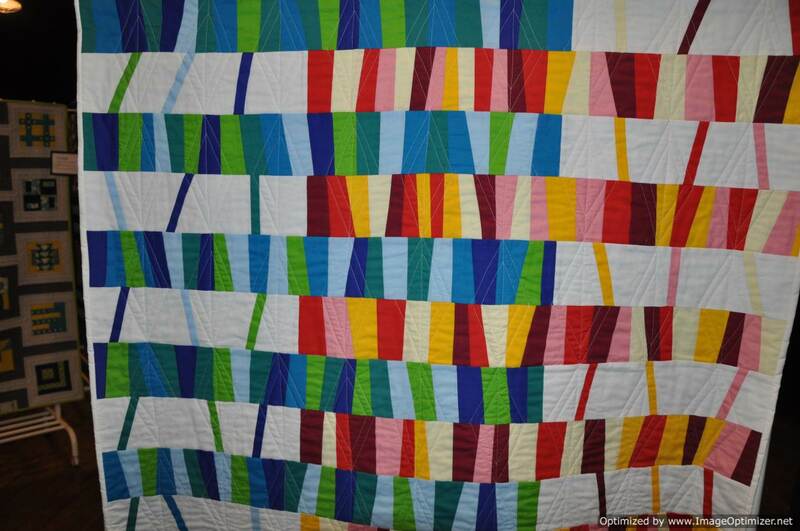 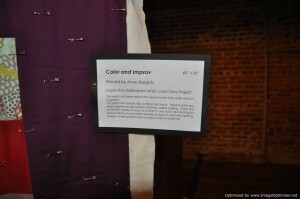 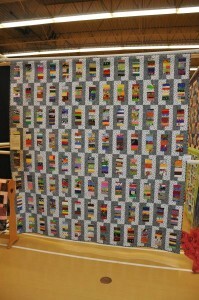 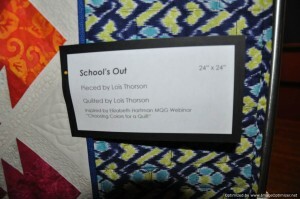 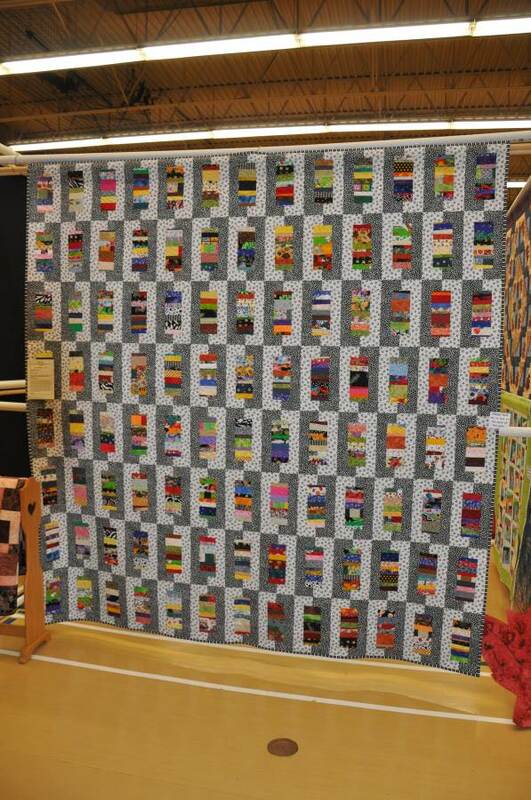 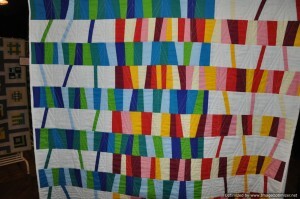 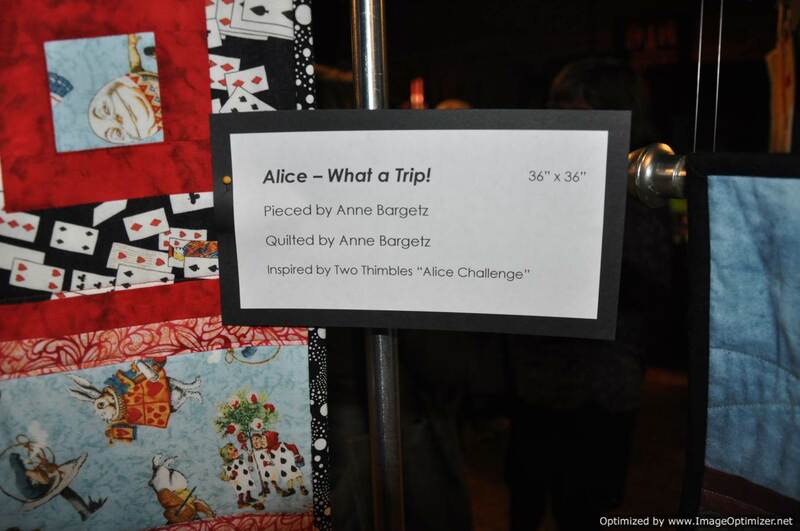 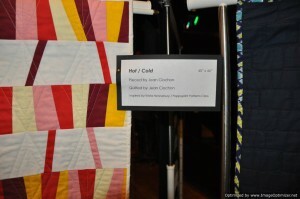 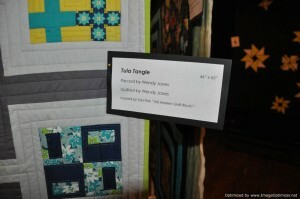 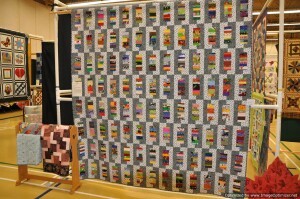 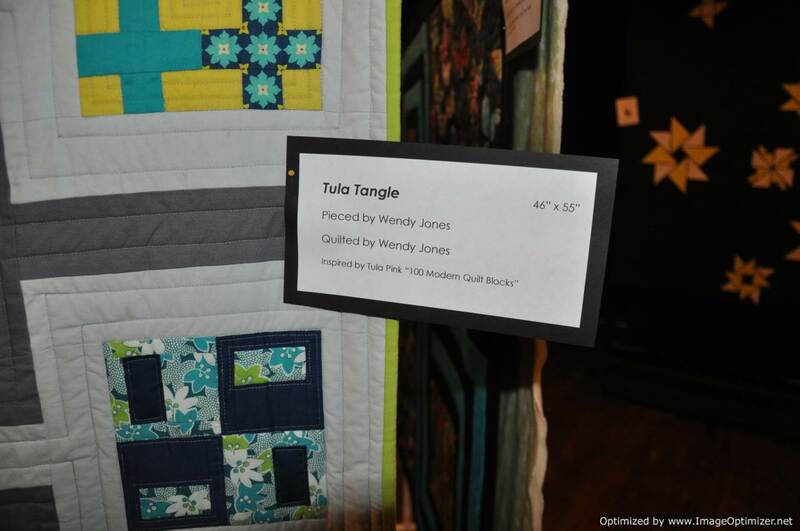 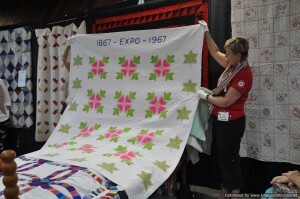 Members were allowed to enter a large quilt along with their challenge quilt. 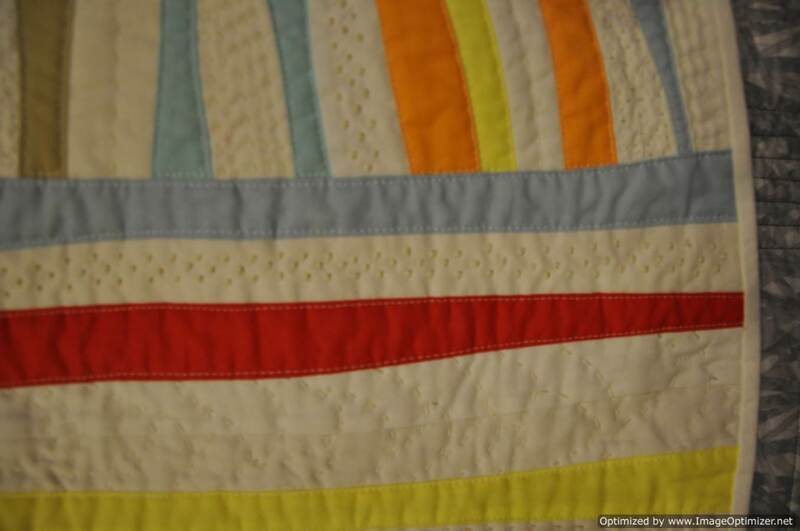 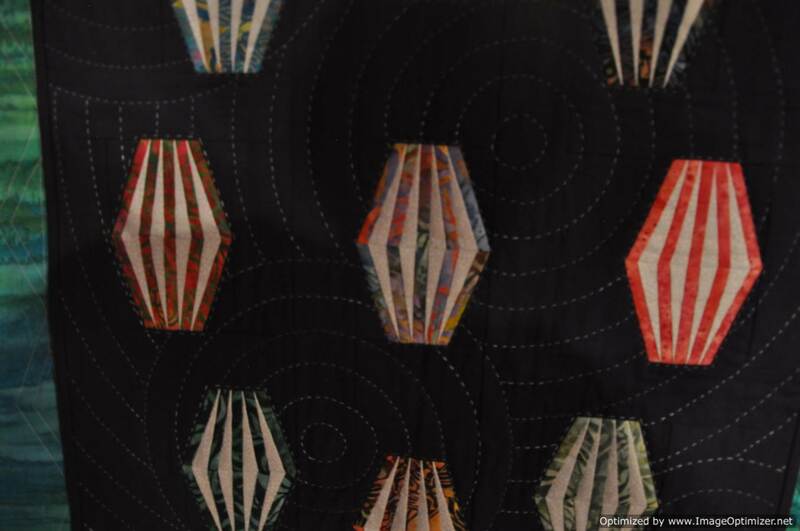 Since we were required to use just solids in our challenge quilts, I decided to pick one of my quilts that is exclusively made from solids – Paint Chips. 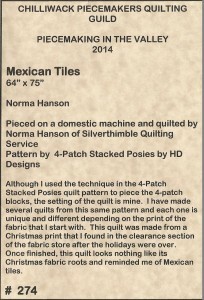 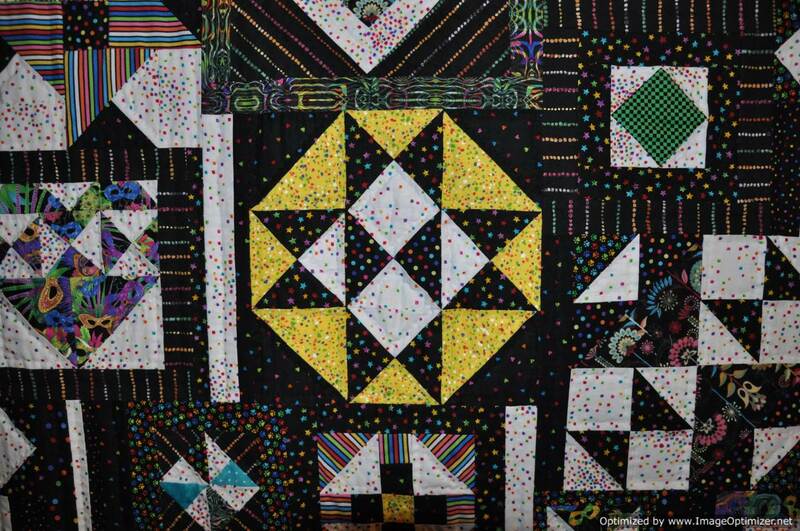 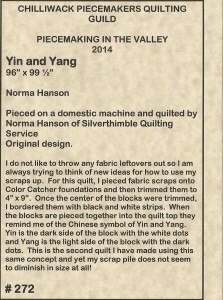 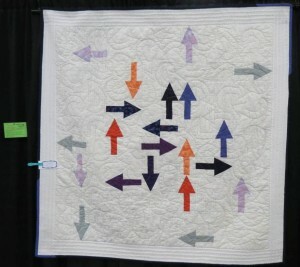 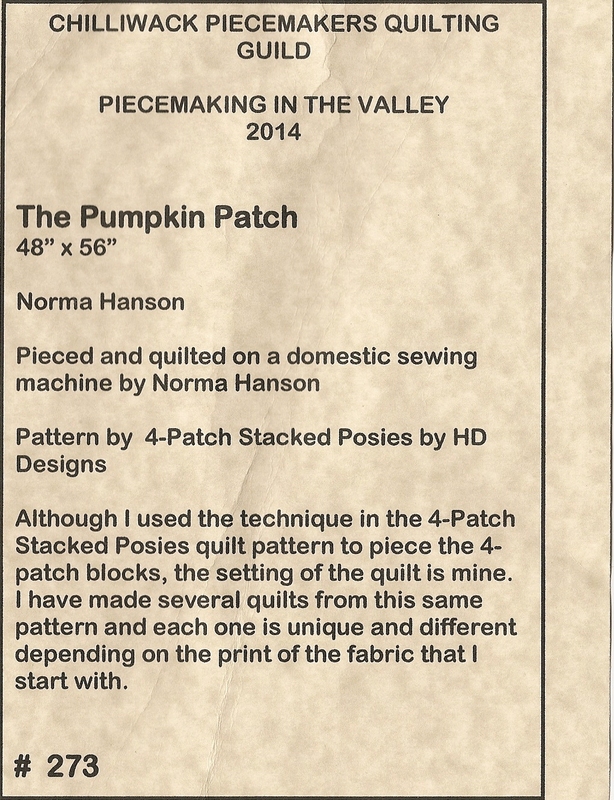 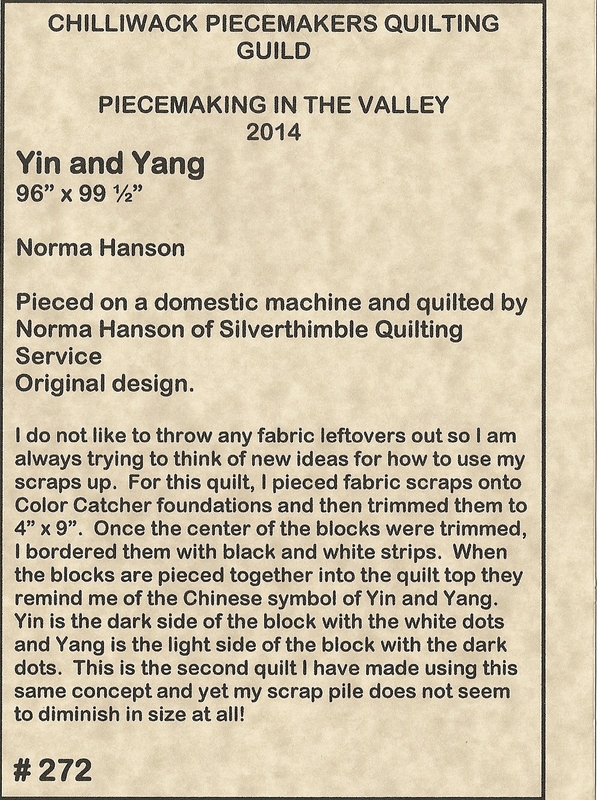 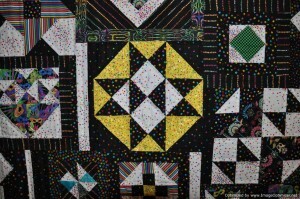 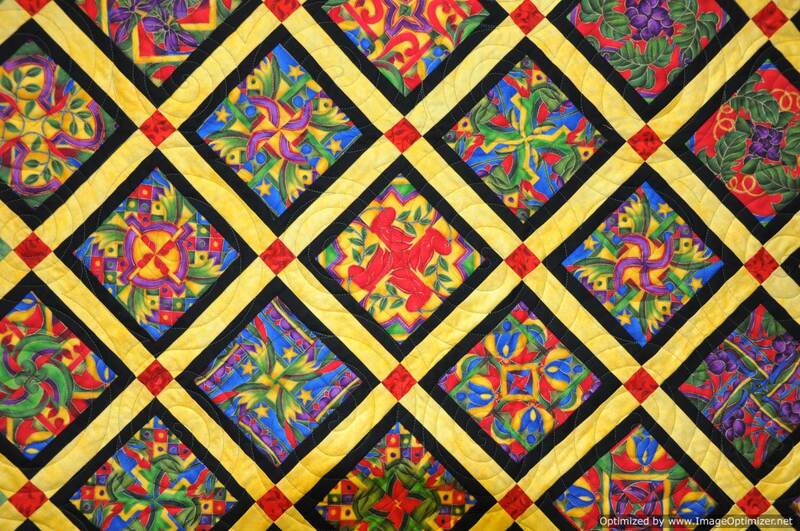 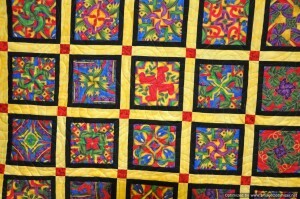 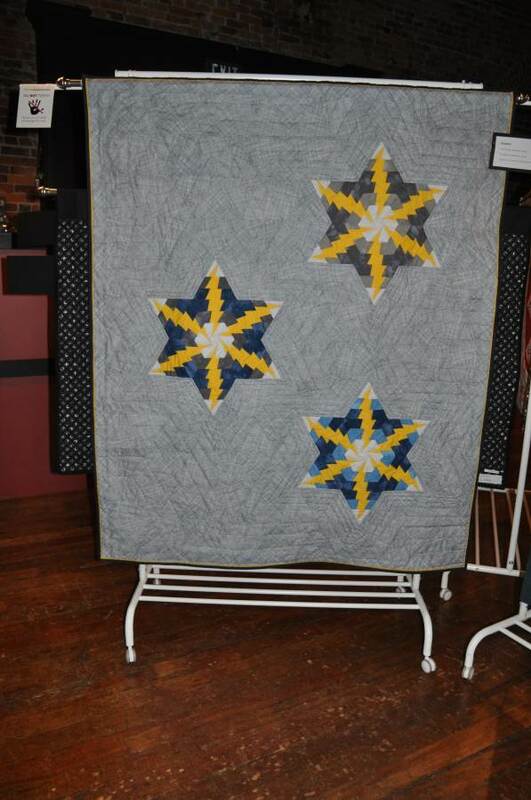 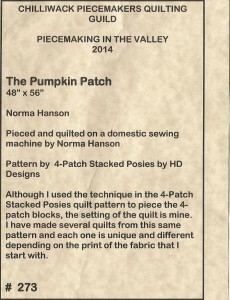 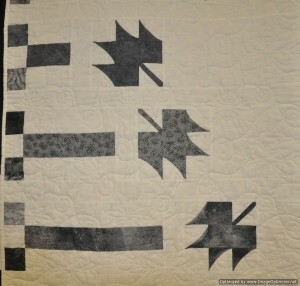 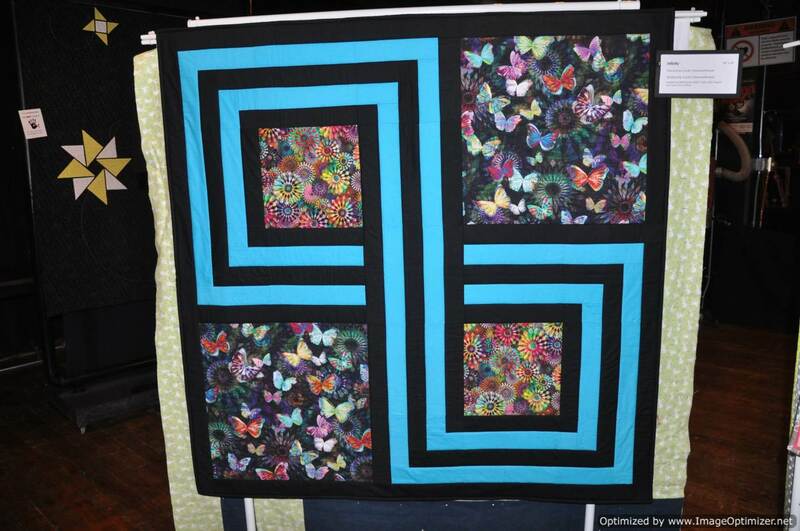 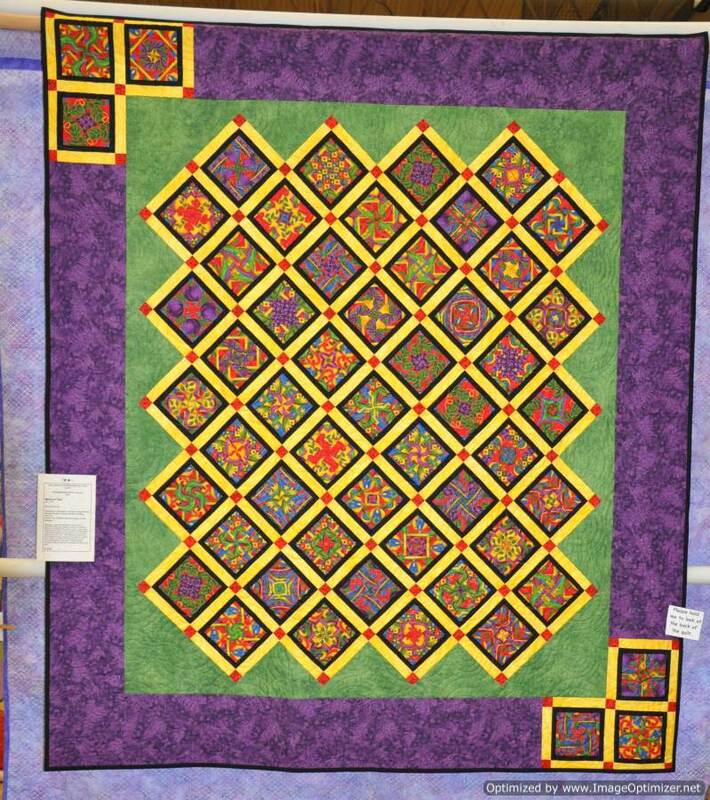 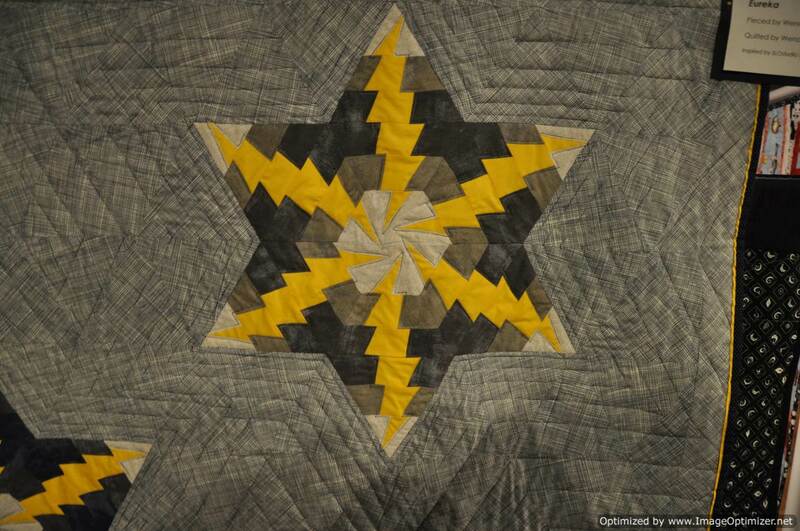 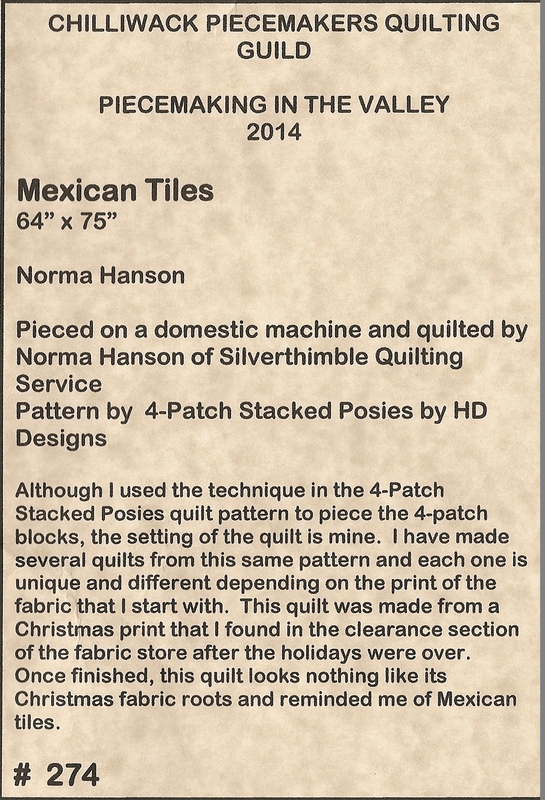 The designer of the quilt pattern is Karla Alexander. 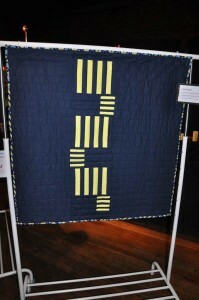 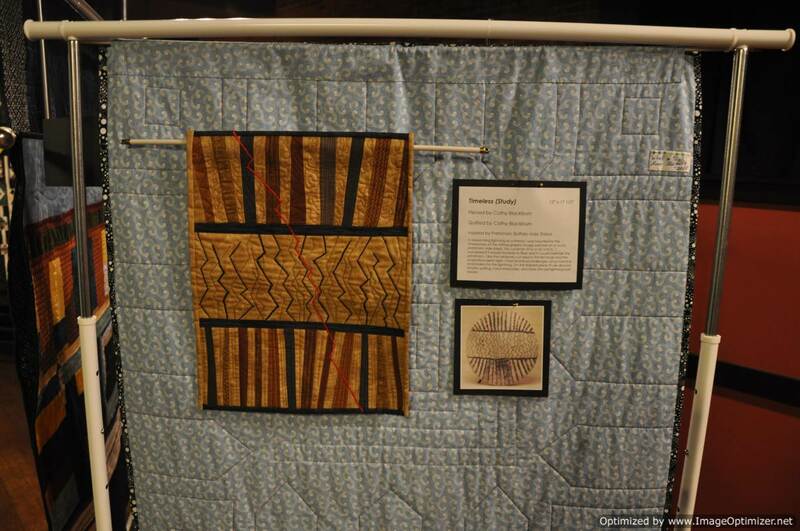 Other member quilts that were displayed follow. 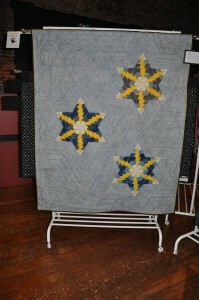 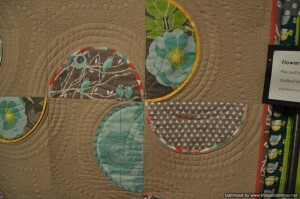 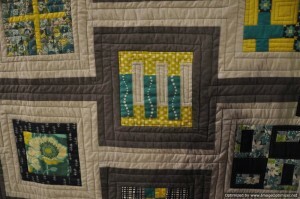 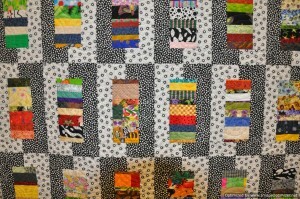 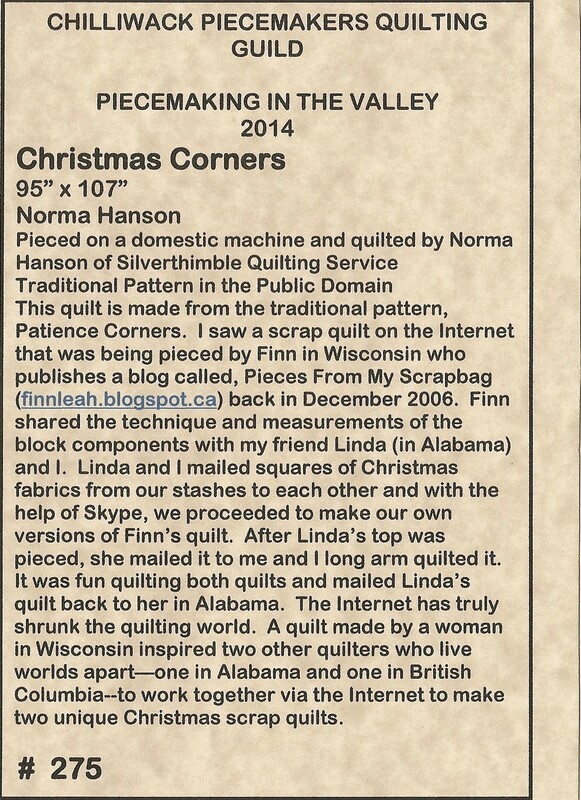 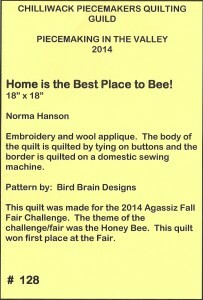 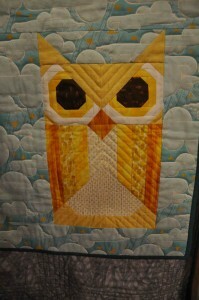 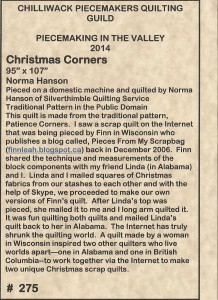 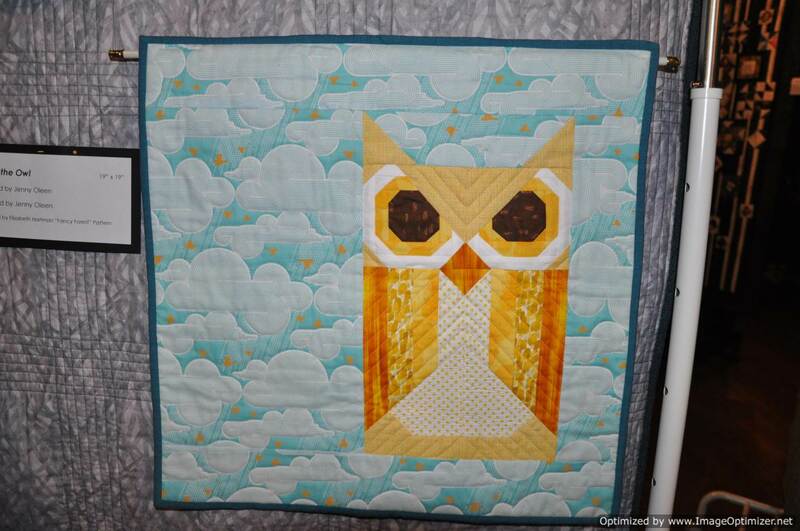 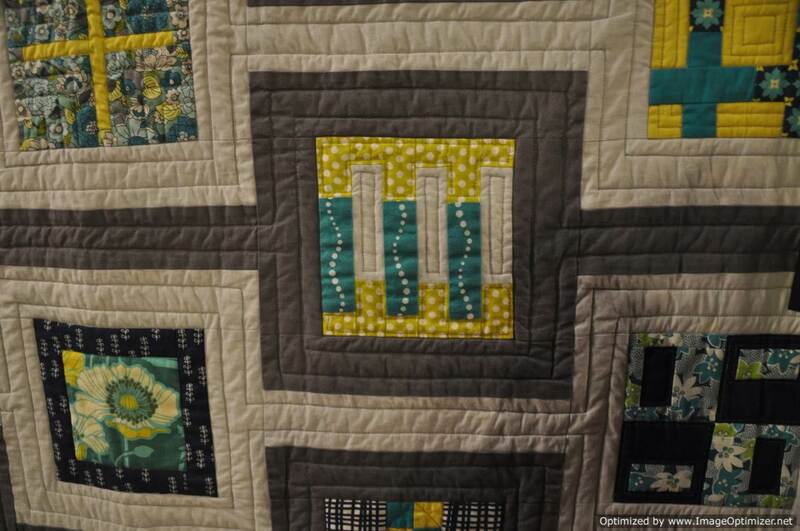 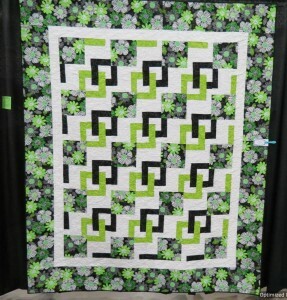 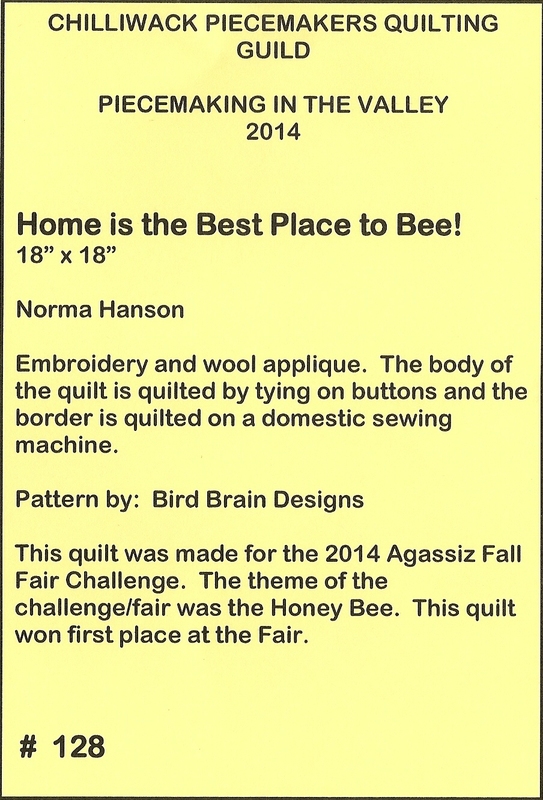 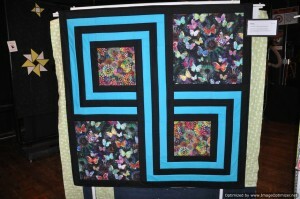 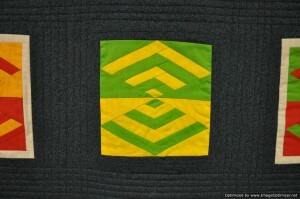 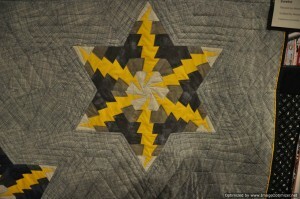 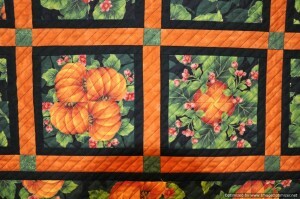 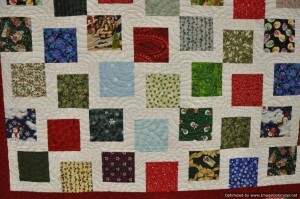 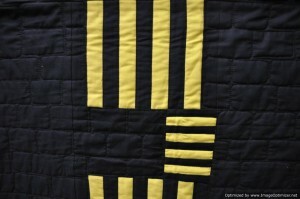 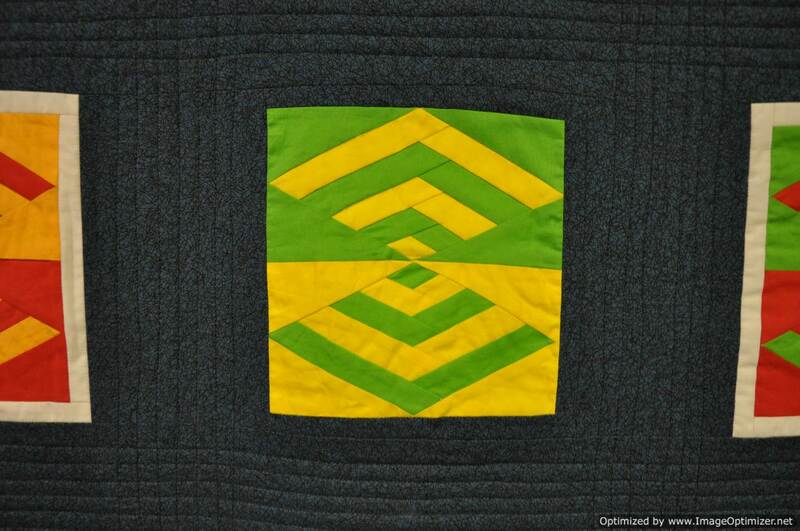 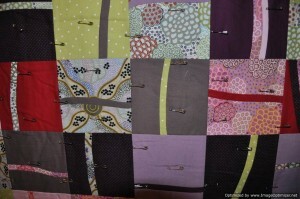 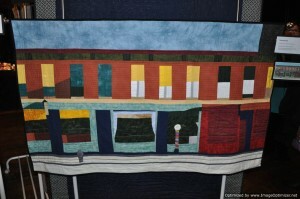 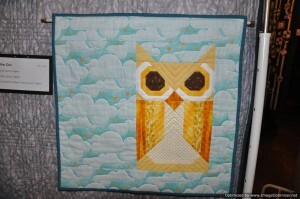 We have a very talented group of quilters in our guild. 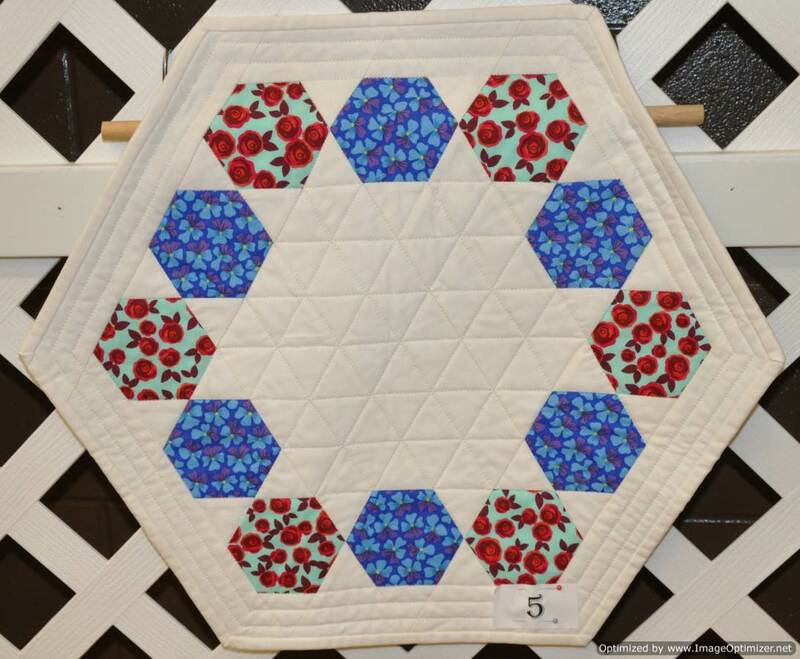 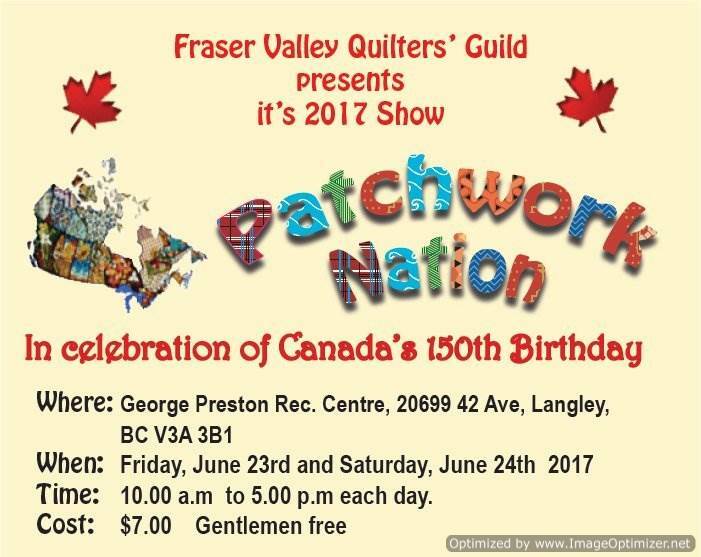 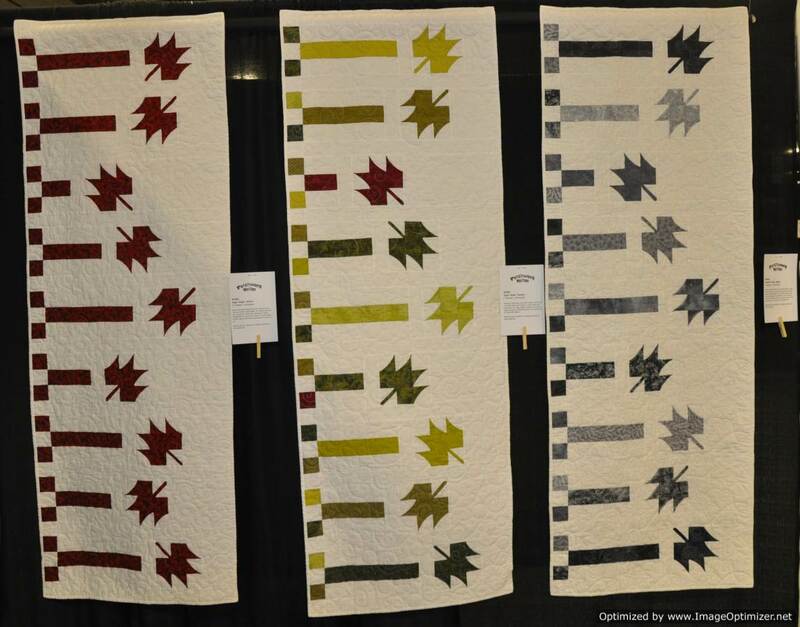 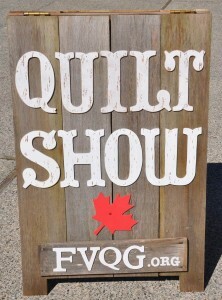 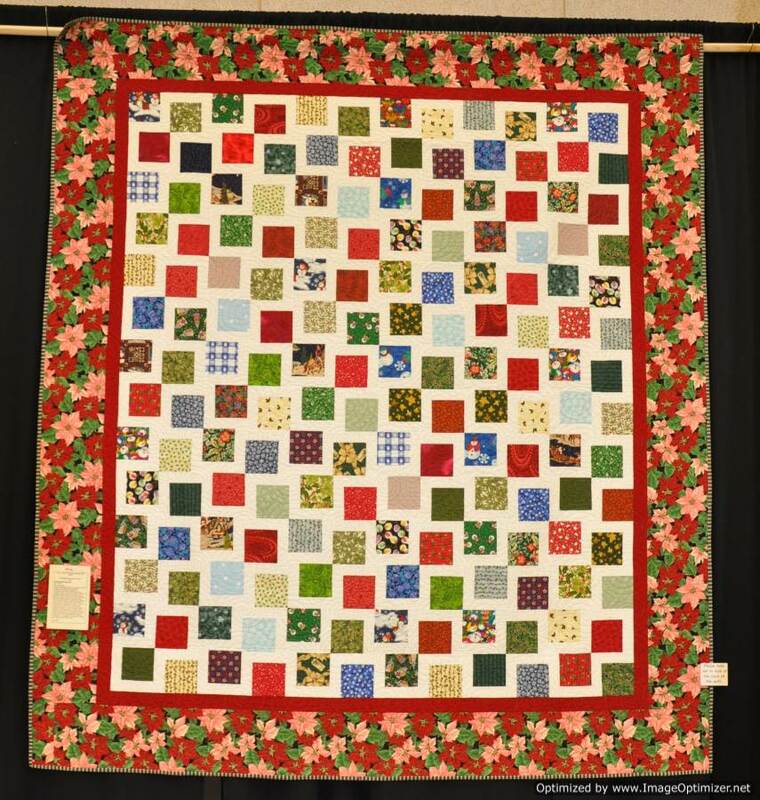 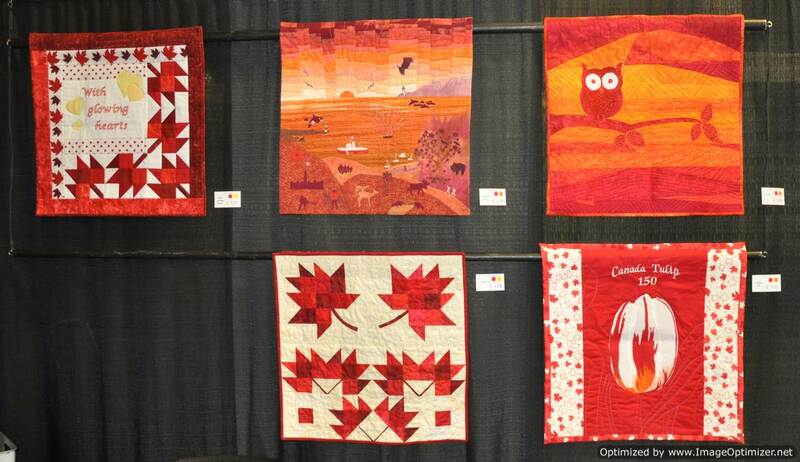 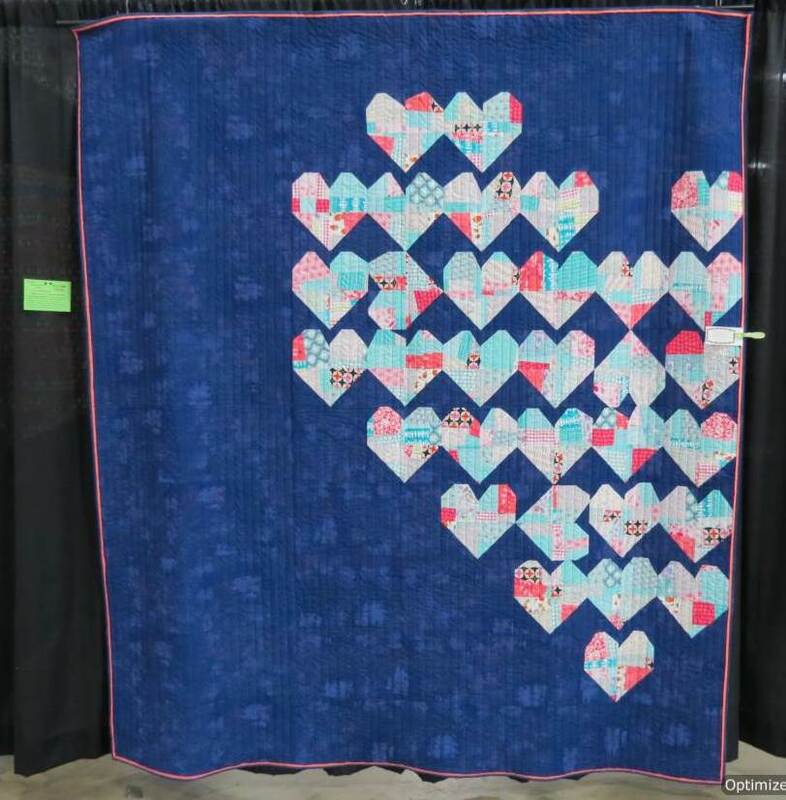 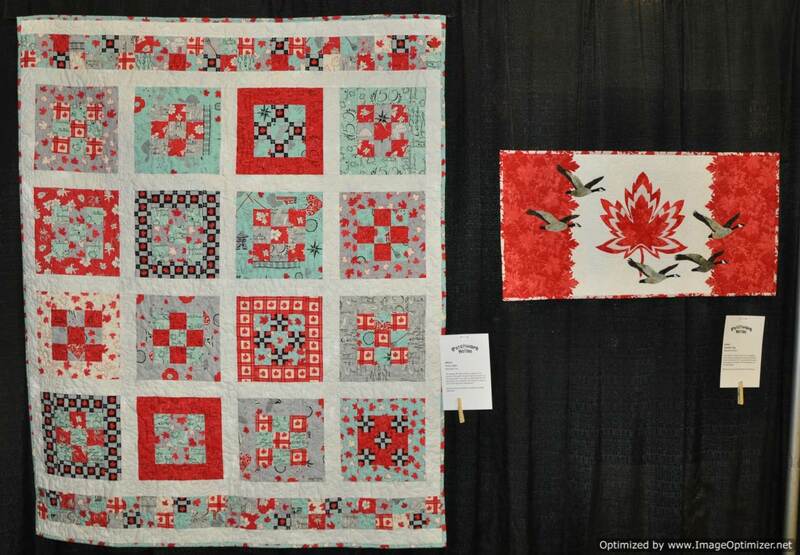 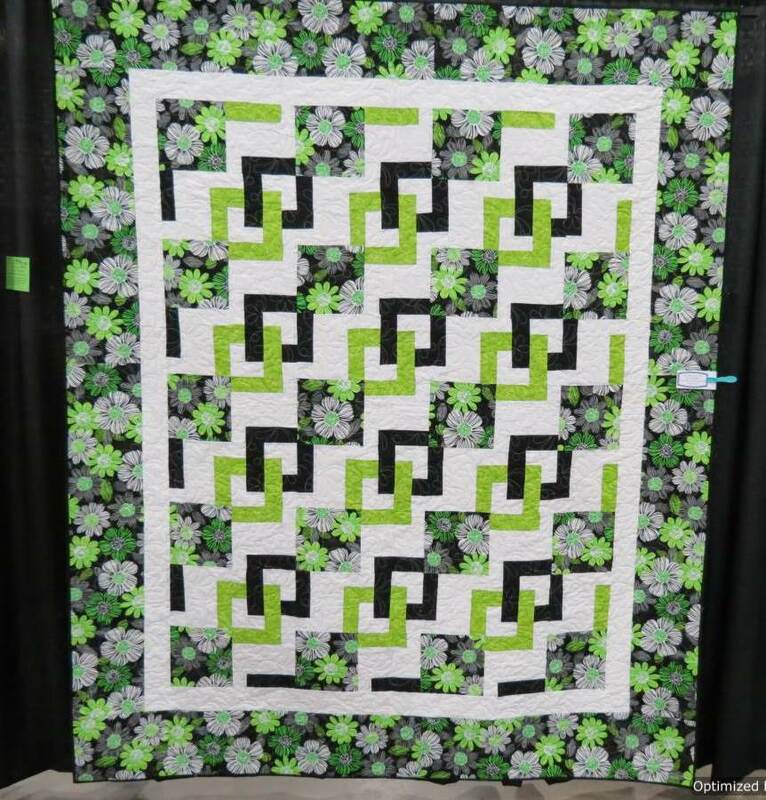 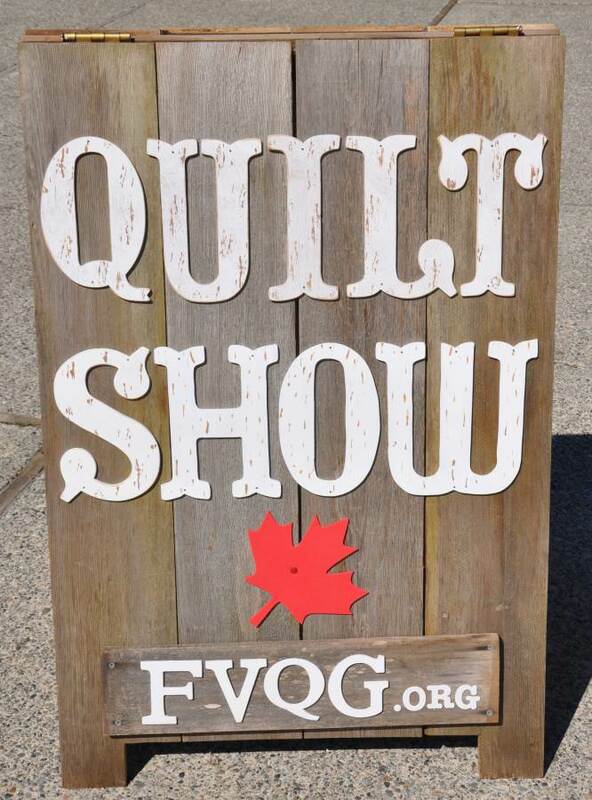 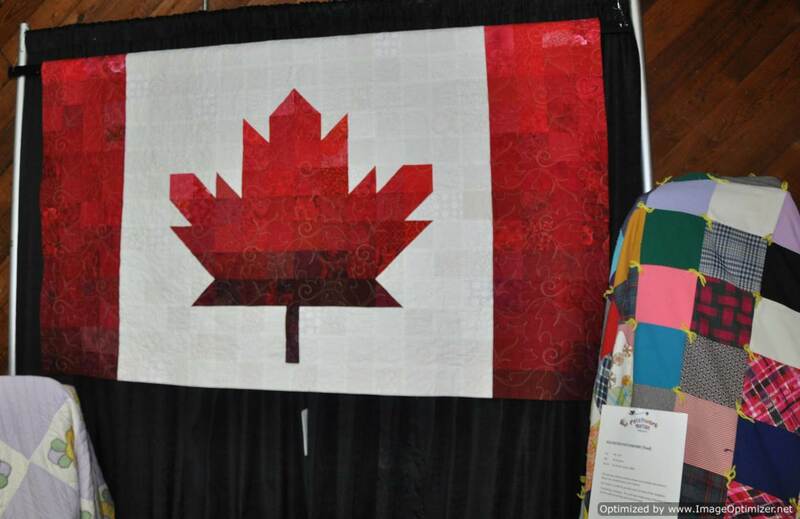 FVQG Quilt Show – June 24, 2017 and Happy 150th Birthday Canada! 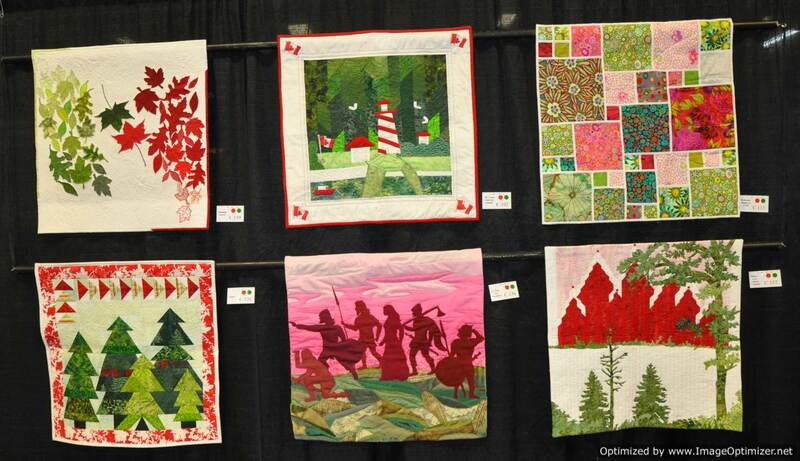 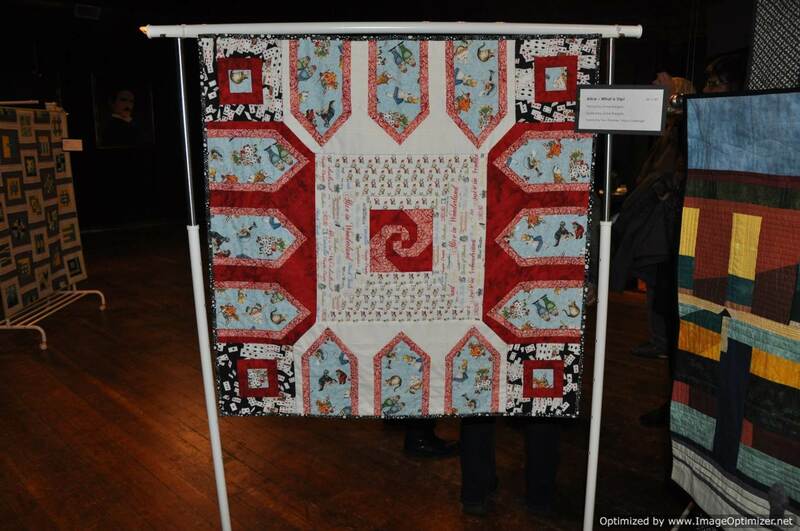 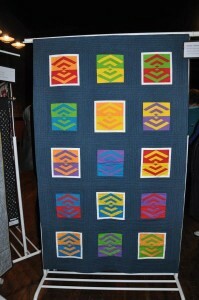 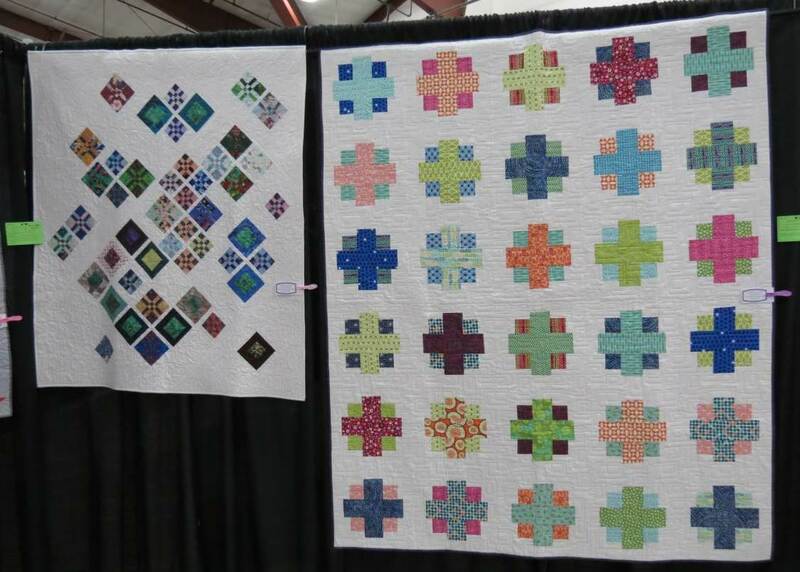 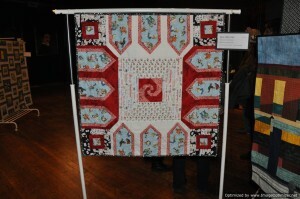 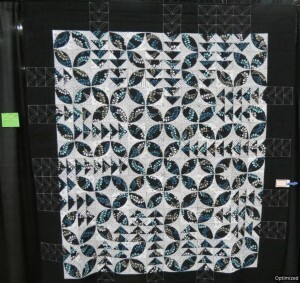 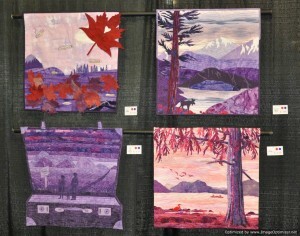 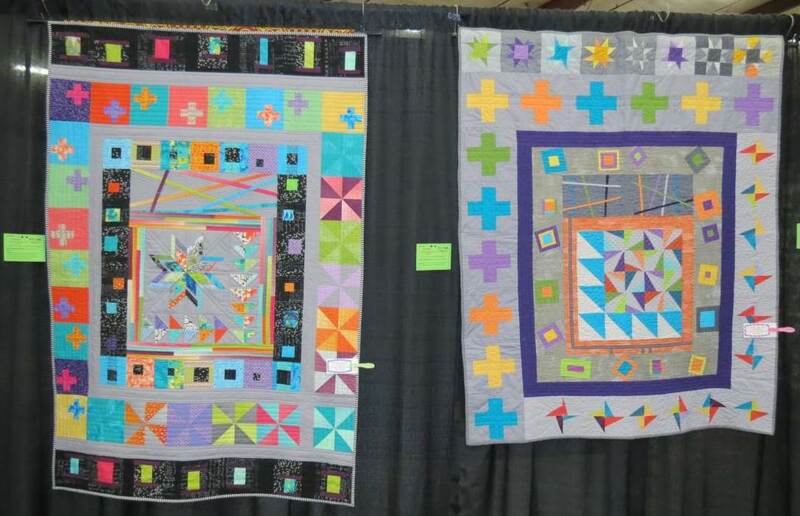 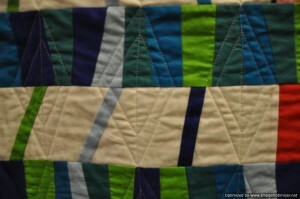 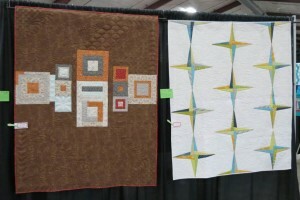 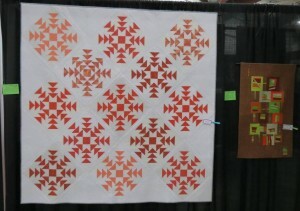 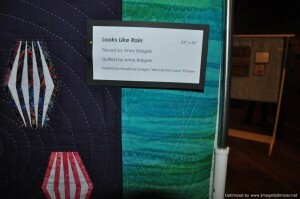 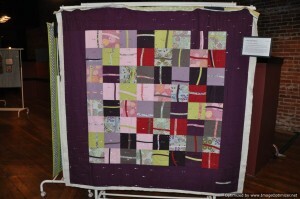 I attended the Fraser Valley Quilters’ Guild quilt show last weekend. 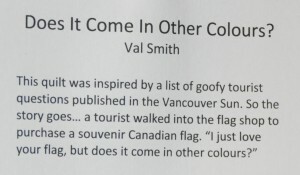 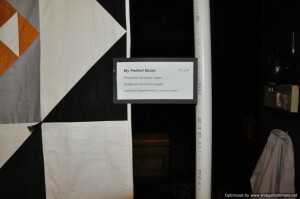 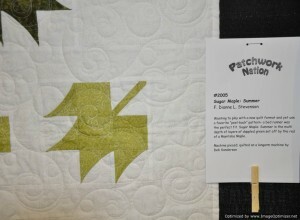 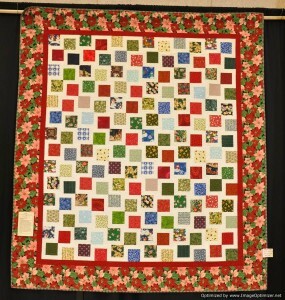 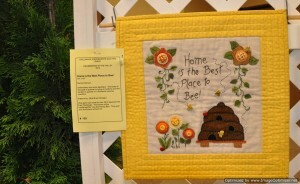 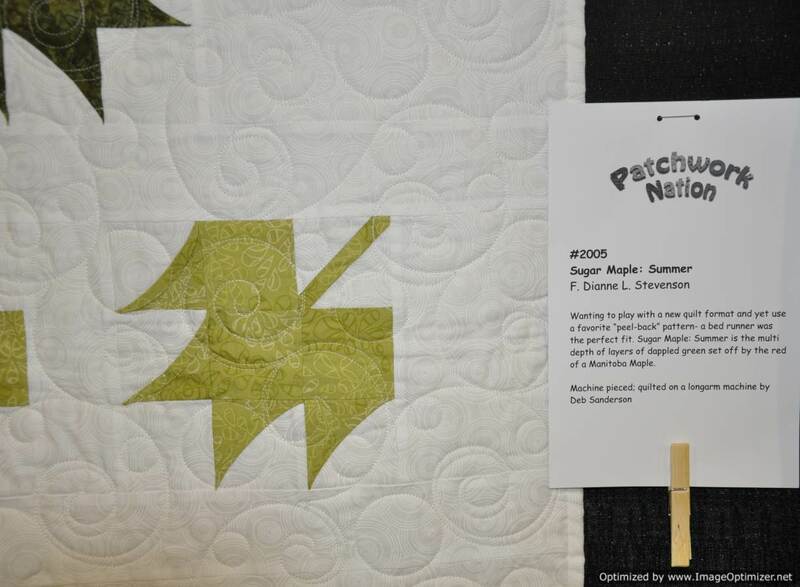 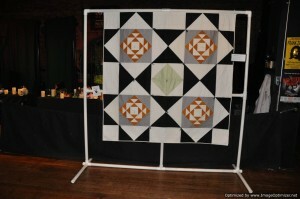 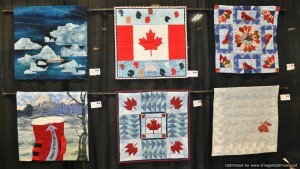 The name of their show was, Patchwork Nation and featured many Canadian themed quilts. Since today is Canada’s 150th birthday it seems appropriate to feature some of the quilts from that show. 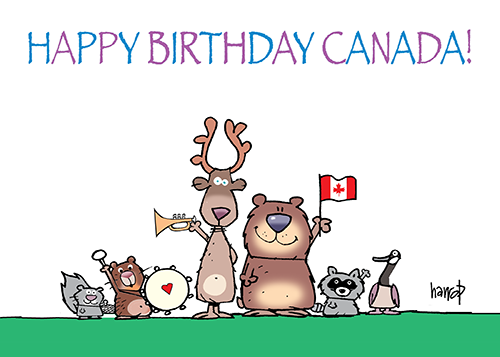 Listen to Canadian Astronaut, Chris Hadfield and his brother, Dave sing a polite little song they wrote about Canada. 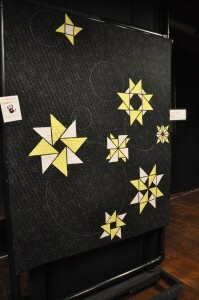 The decor outside of the show definitely gave you a hint as to the theme of many of the quilts inside. The challenge quilts were fabulous! Every quilter had to use the colour red in their project and one other colour that was drawn at random from a paper bag. 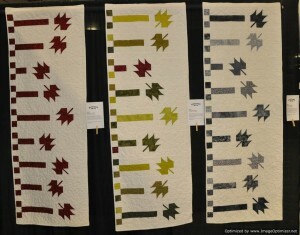 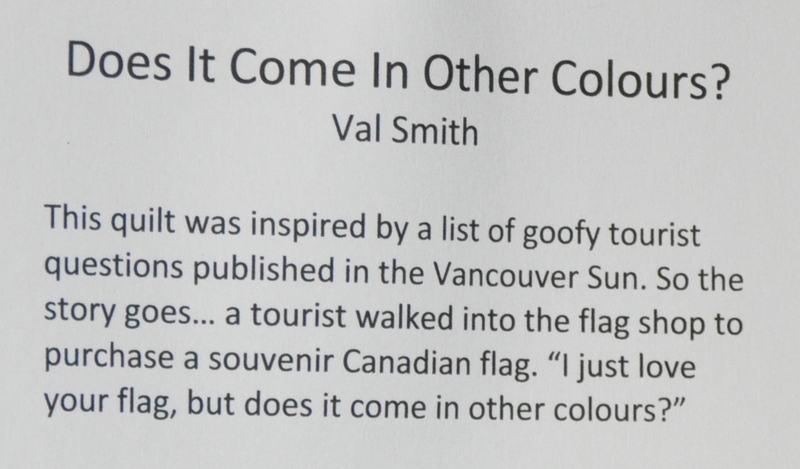 You can see the mandatory colours that were used in each quilt on a piece of paper next to each quilt. 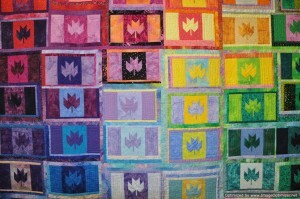 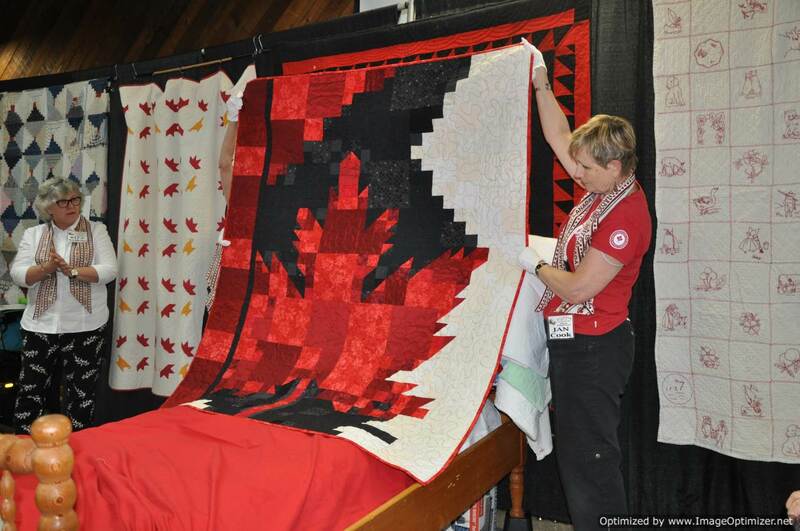 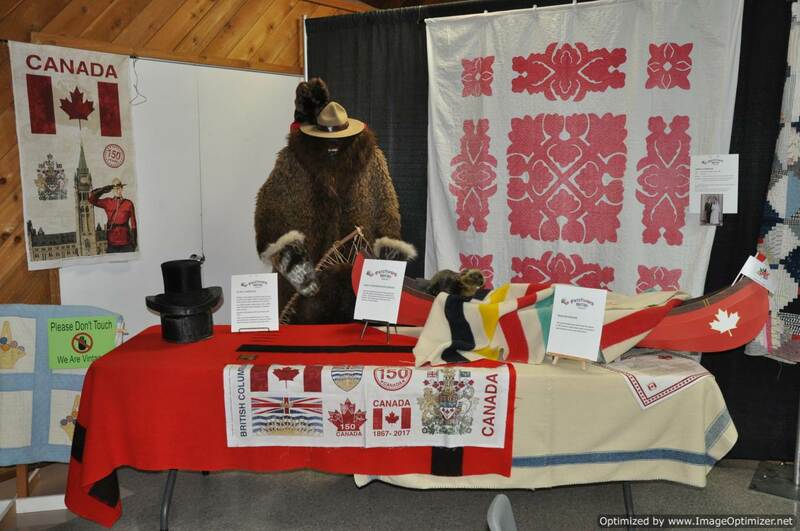 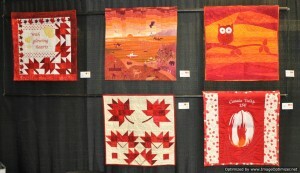 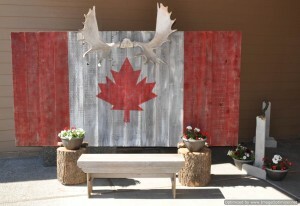 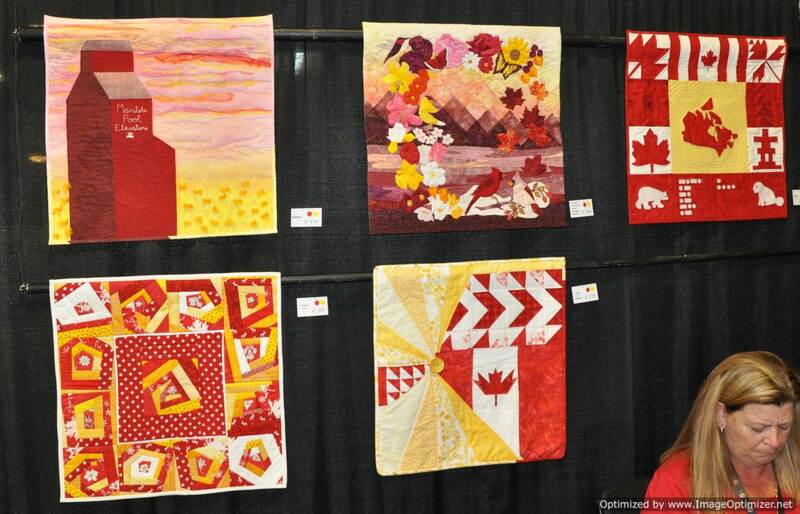 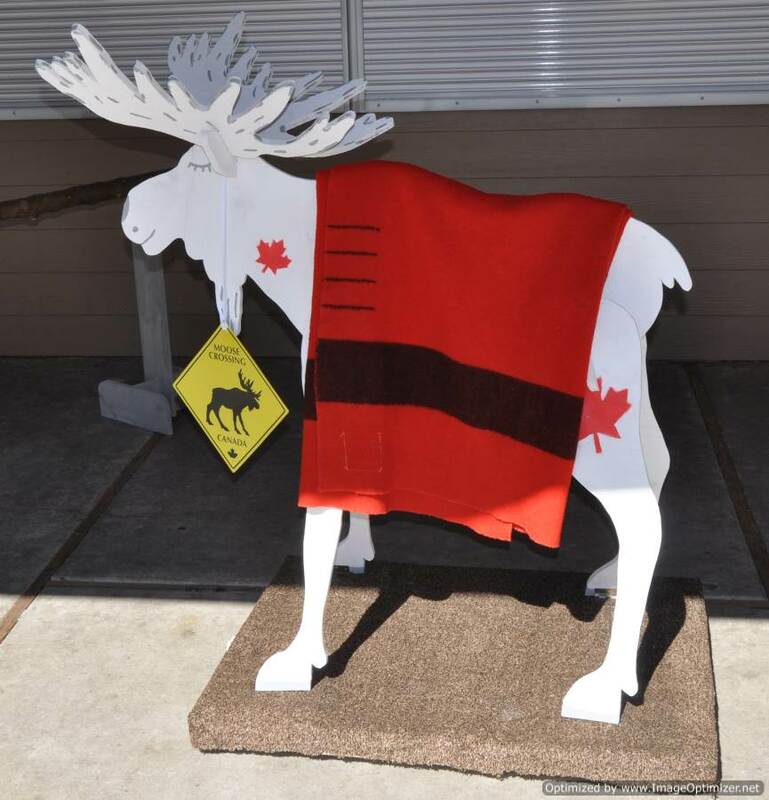 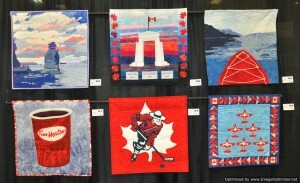 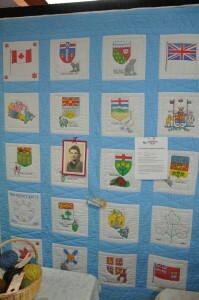 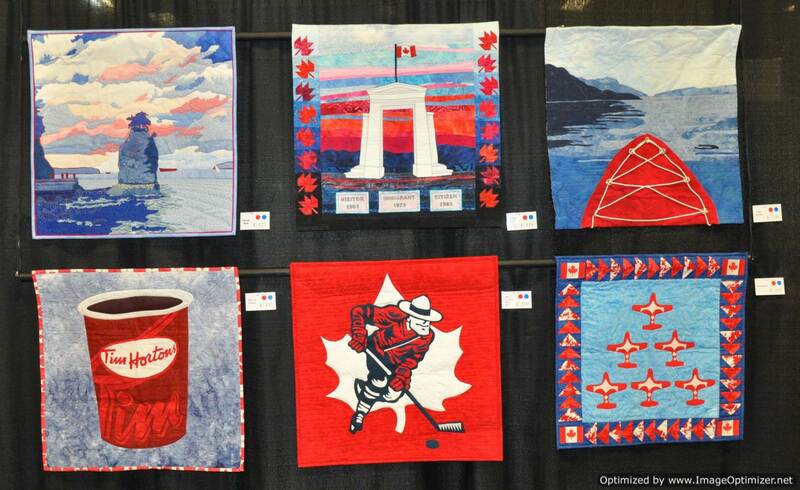 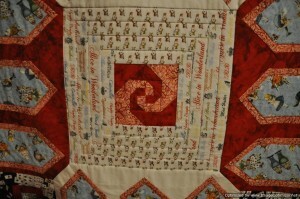 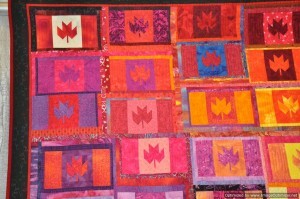 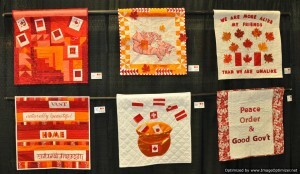 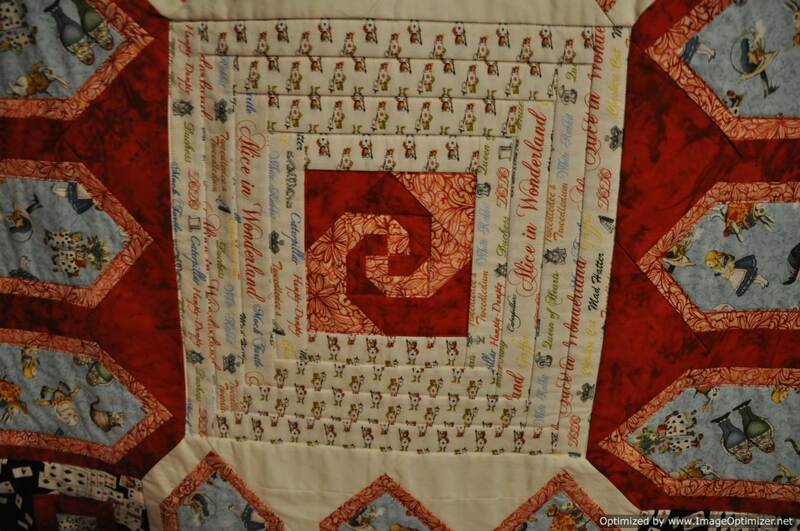 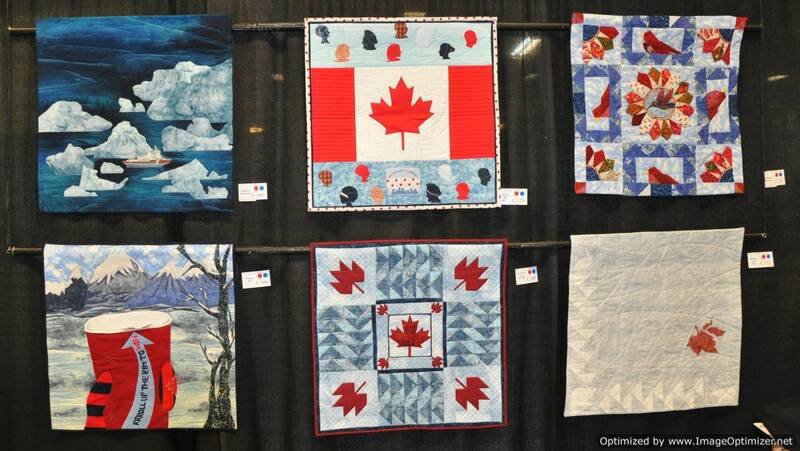 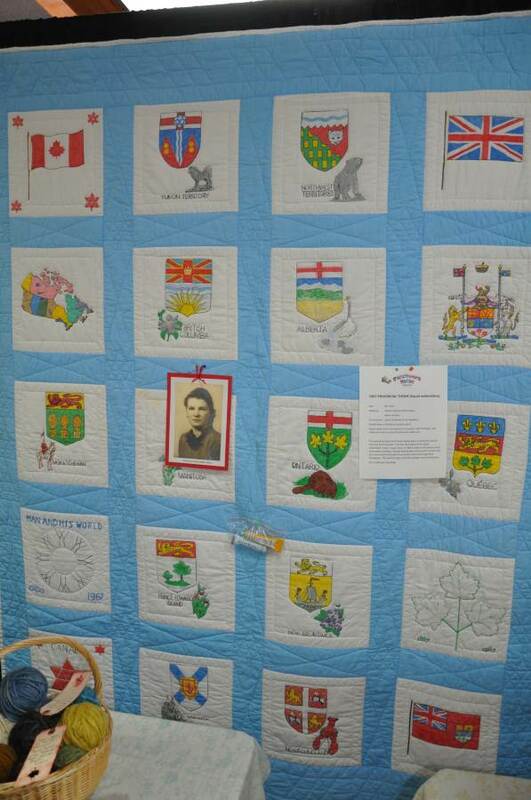 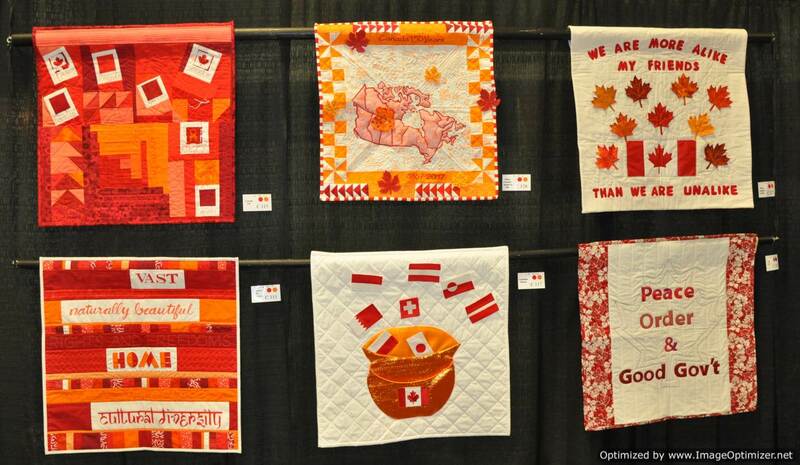 The following images were of quilts that centered around the Canadian theme. 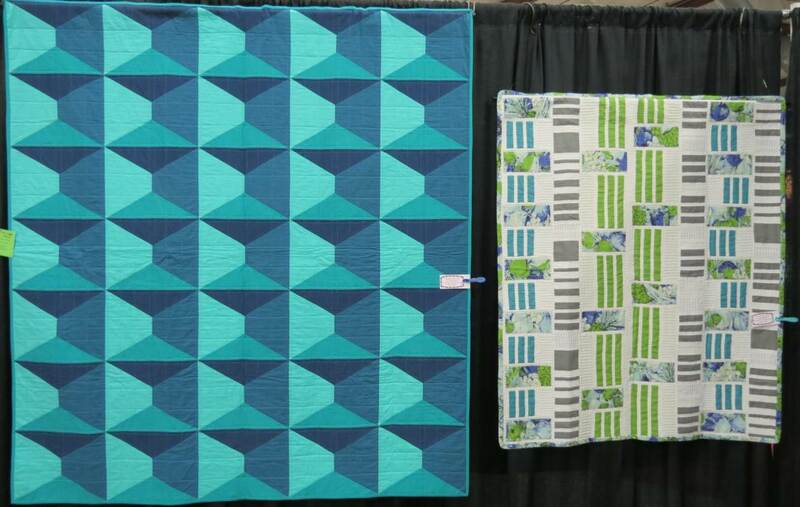 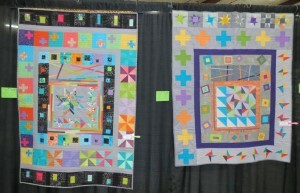 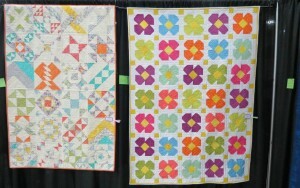 These two fabulous quilts were part of the Premie Quilt donation program that the guild supports. 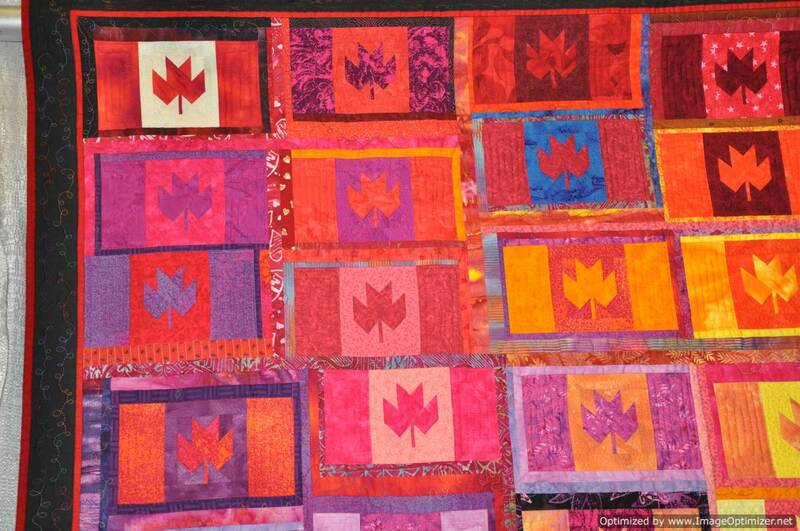 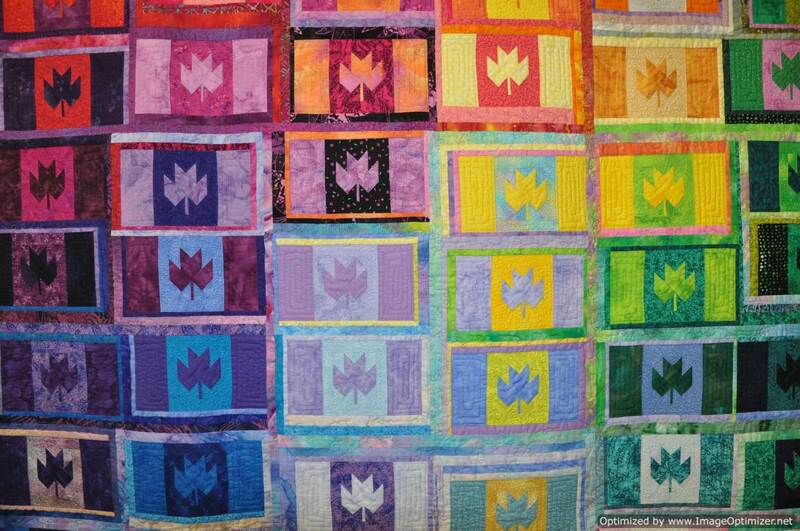 This guild donates on average 500 quilts to the NICU (Natal Intensive Care Unit) at Women’s Hospital. 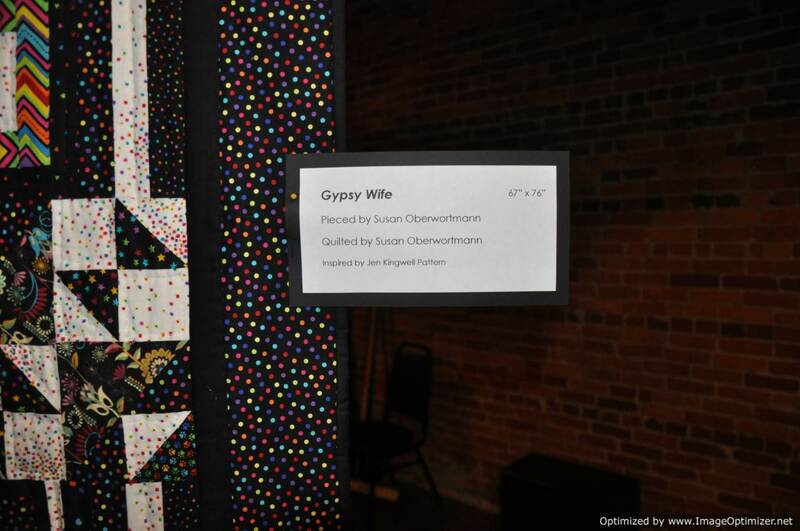 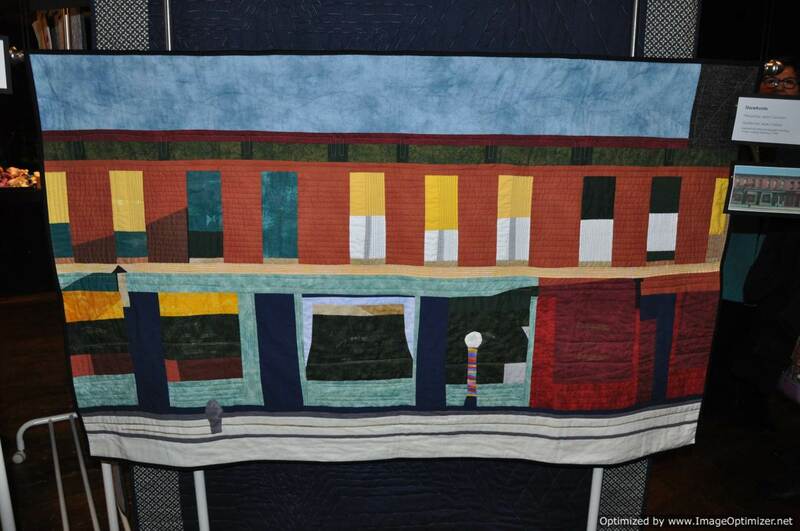 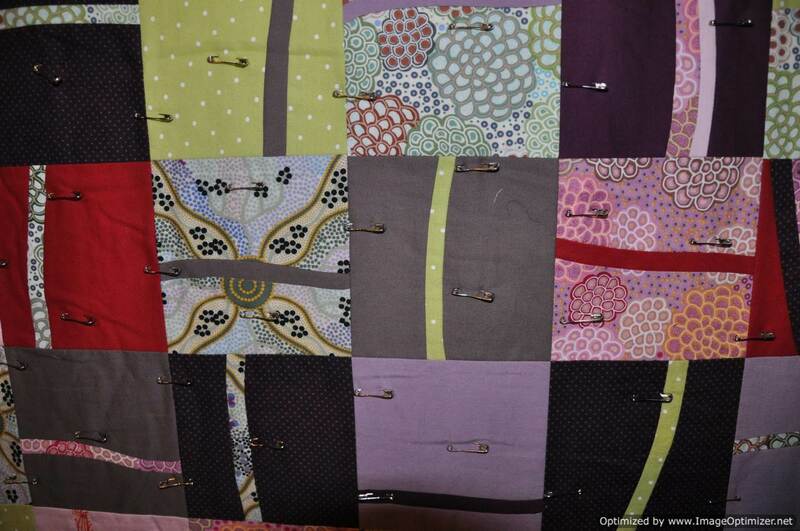 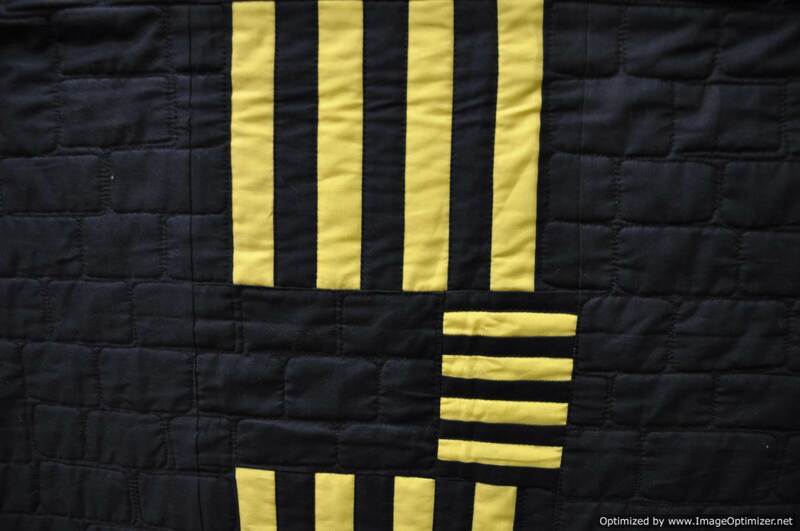 Every time I hear the story around this quilt it makes me smile. 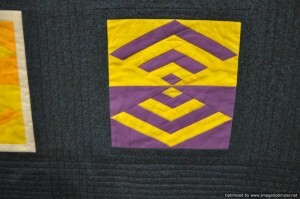 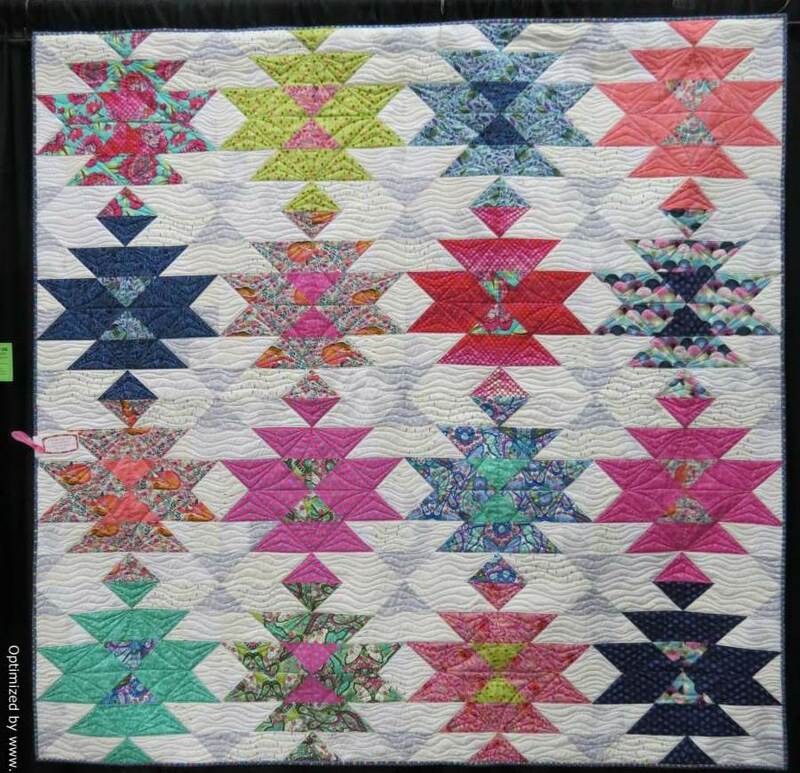 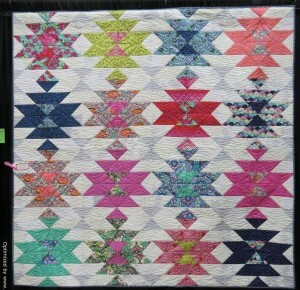 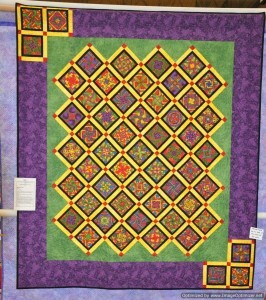 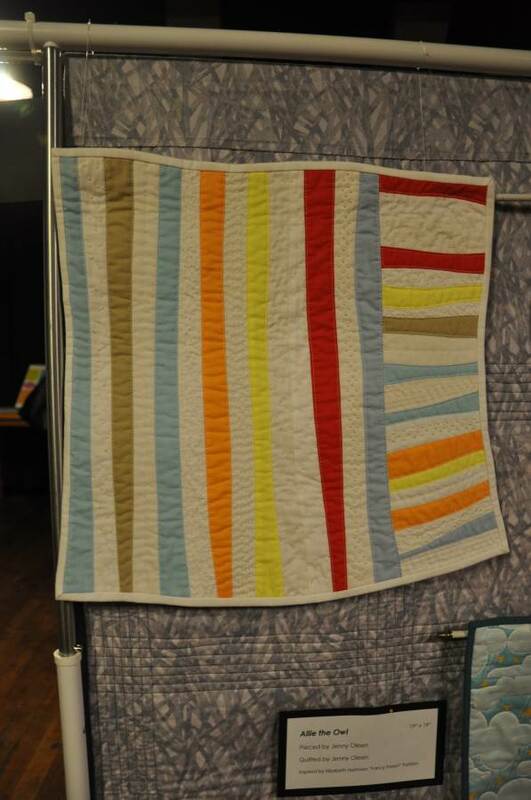 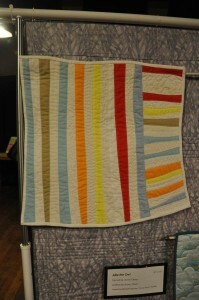 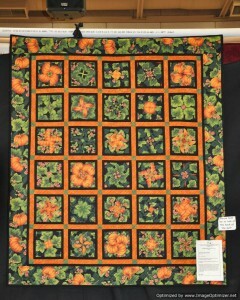 This quilt is by Val Smith and is called, Does It Come In Other Colours? 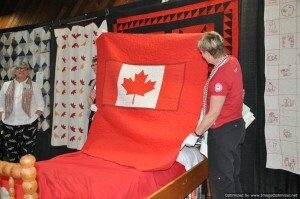 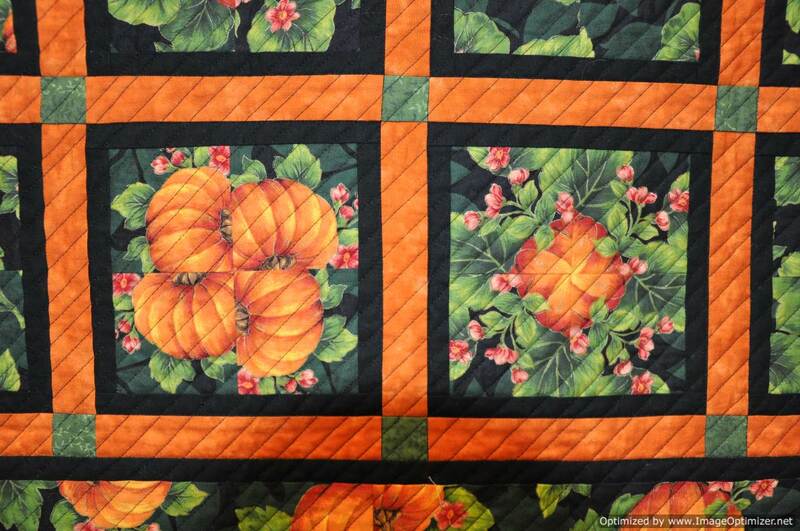 There was also a bed turning which featured quilts from Canada over the last 150 years. 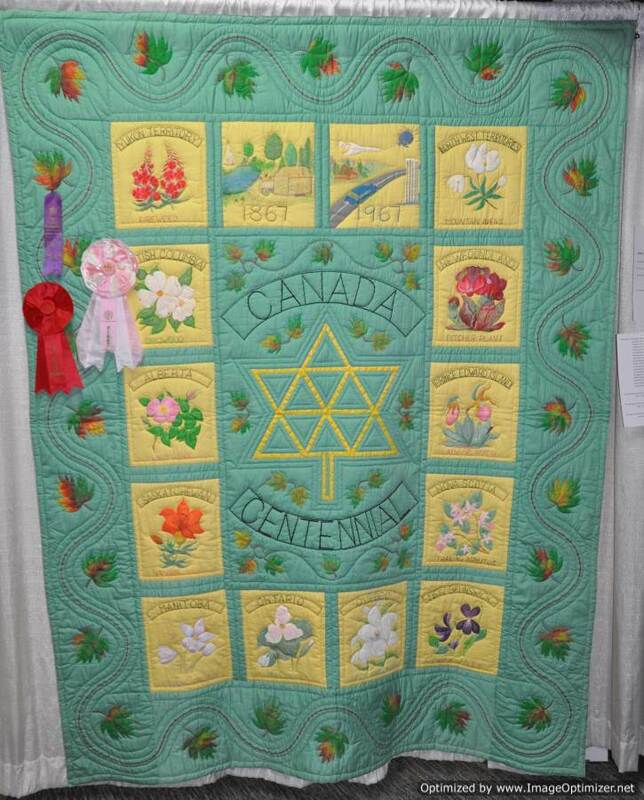 This quilt was from our Centennial in 1967 and featured the symbol of Canada’s Centennial in the border. 1967 was also the year that Montreal hosted EXPO. 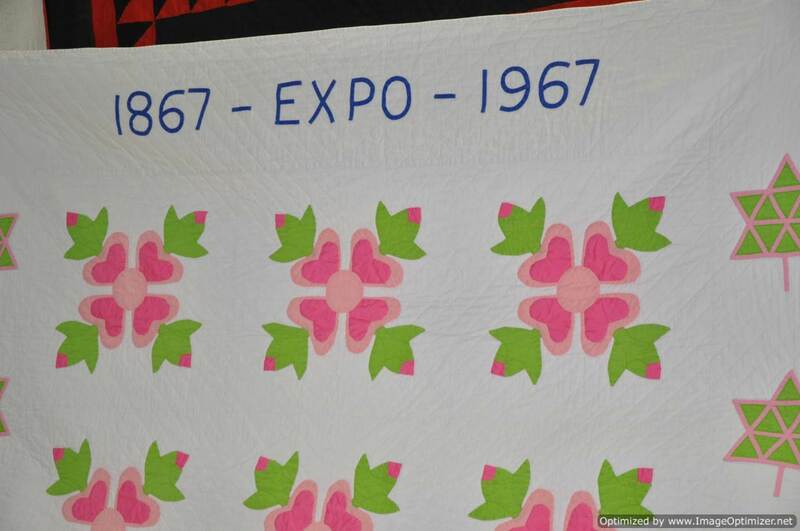 This vintage quilt was from 1967 and featured the crests and flowers from each province. 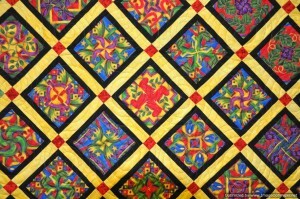 The designs were drawn on fabric and then coloured with liquid embroidery. 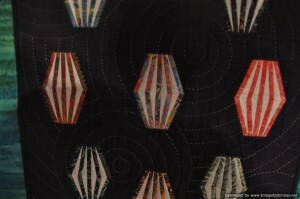 I remember the tubes of Artex paint that my mother used to have. 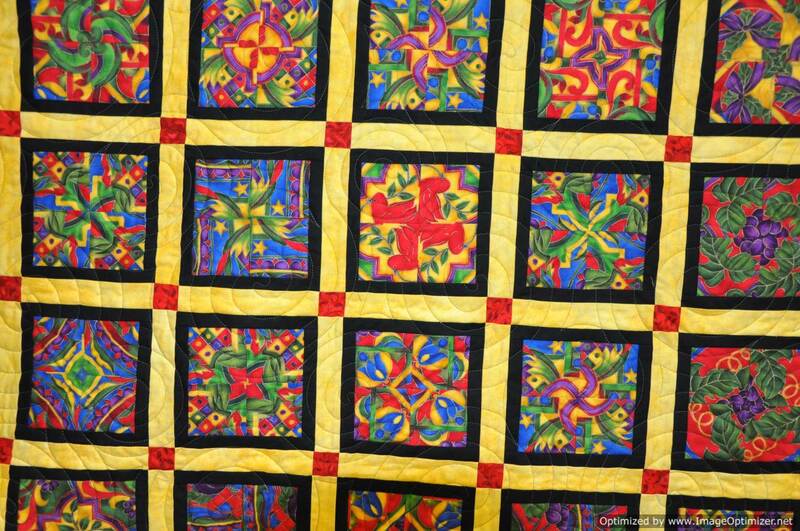 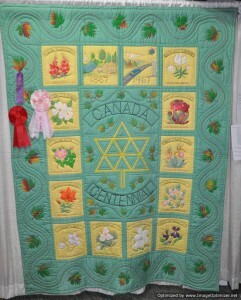 :) This is another Canadian Centennial quilt that was painted with Artex. 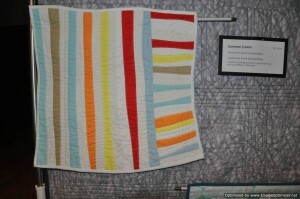 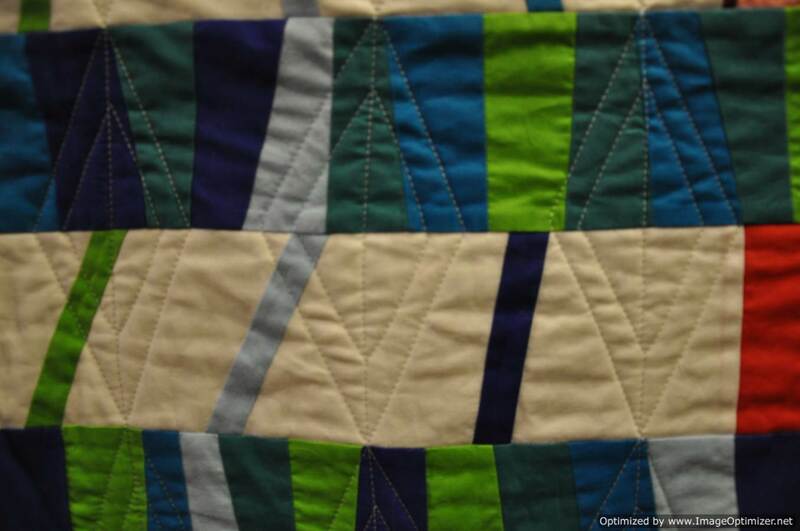 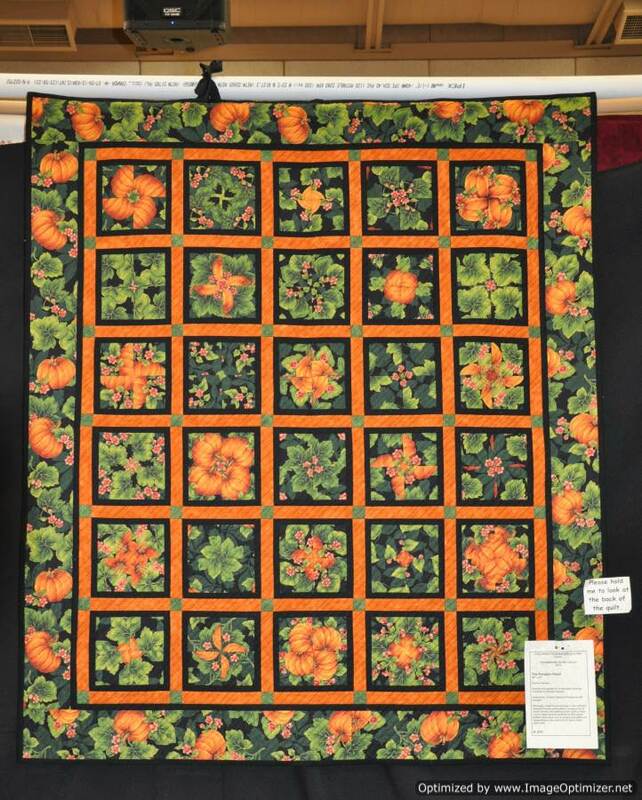 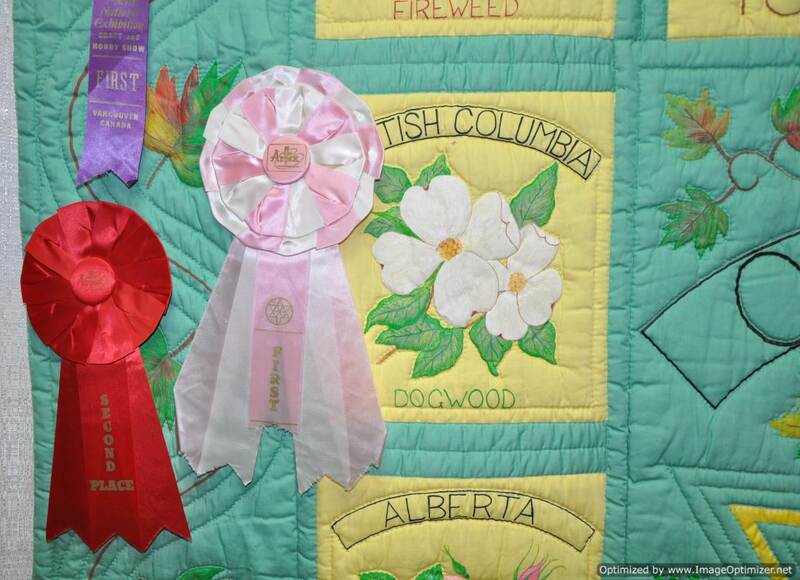 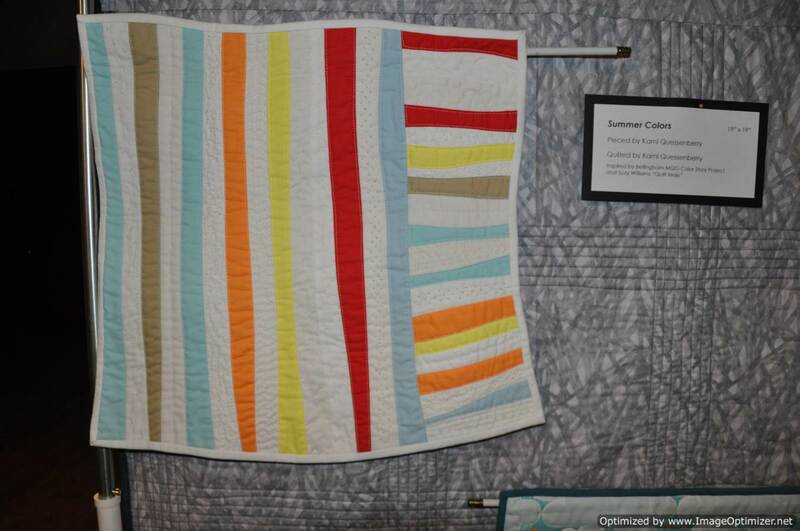 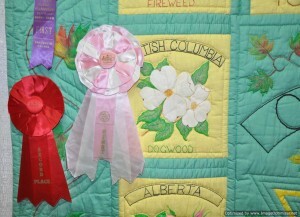 This quilt won first prize at the PNE in Vancouver in 1967. 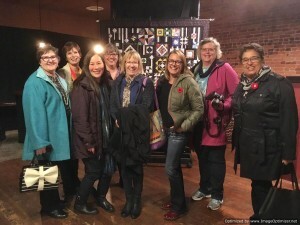 Last night, I attended the Bellingham Modern Quilt Guild’s first quilt show with a group of quilters from the Vancouver Modern Quilt Guild and Fraser Valley Modern Quilt Guild. 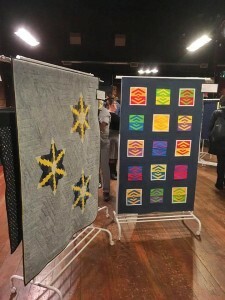 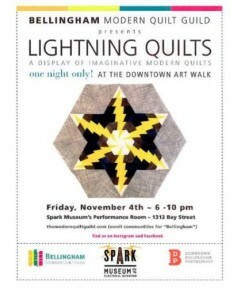 Althought the show was small, the quality of quilts was high, and the variety of quilts was great. It was a great way to showcase a new guild and recruit potential new members. 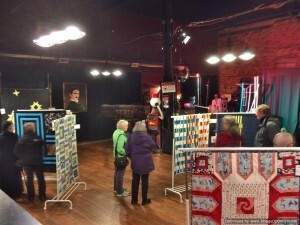 This is a photo of the Canadian Quilters that attended and supported the Bellingham Modern Quilt Guild in their first showcase of quilts to the community. 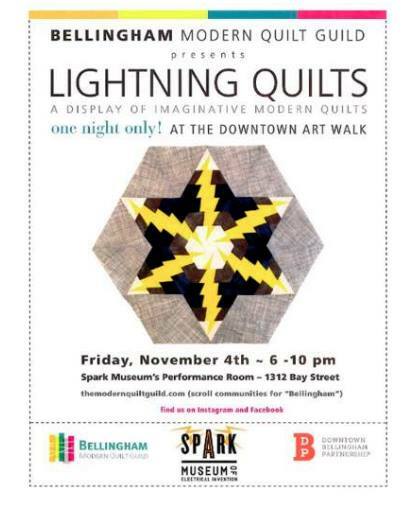 Well done Bellingham Modern!